Democracy certainly does not mean that the majority opinion should be neglected. One may call it majoritarianism or anything else but no government should or could ignore the views of the majority. It also does not mean that the minority opinion should be neglected and it is up to the government to decide on the policy considering all the opinions. However, that does not mean that all opinions could be implemented as it would result only in chaos. In any event governments in so called democratic countries are elected by the majority and not by the minority, especially when the minority opinion is dictated by the foreigners. .
What is the majority opinion of the country on the 13th amendment and the LLRC report. The Sinhala majority may not agree with all that I have expressed on these matters, but I am aware that the vast majority of the Sinhala opinion is against the 13th amendment and do not want the LLRC report to be implemented in full. Even if the government has previously said that it would implement the thirteenth amendment plus and the LLRC report the government has the liberty to change its policy taking into consideration the majority opinion. After all there is no government or political party in the world that has maintained the same policy over a period of time and any political party is entitled to change its policy if those who vote for the party want it so. The SLFP has changed its policy over the last sixty three years or so. It is true that the language policy of the SLFP was not Sinhala only at the inception of the party though the Sinhala Maha Sabha was the organization that Mr. Bandaranaike formed following the Hindu Mahajana Sabai of the Tamil leaders. It is also true that the SLFP and the LSSP won the same number of electorates at the 1952 general elections held soon after the formation of the SLFP. The so called political analysts think that the parity of the LSSP was accepted by the Sinhala people over the Sinhala only policy of the SLFP. What these pundits forget is that in 1952 the SLFP did not subscribe to the Sinhala only policy. As we have maintained the Sinhala nationalism is bottom up and it is the people who determine the policies of the nationalist parties. In 1952 as far as nationalism was concerned the Sinhala people were under the impression that the UNP was nationalistic as in their opinion it was that party that won independence to the country. The LSSP and the CP were also considered as nationalistic by some Sinhala people including some Sanga Veda Guru, since the two parties were involved in anti colonialist struggle. Probably the people were not aware or not informed properly that as far back as 1943 the CP had declared that the Sinhalas and Tamils were two nationalities that had existed in the country for thousands of years. In 1952 the Sinhala people were “confused” regarding nationalism (not in the western sense. Western nationalism is associated with capitalism and nation states but Sinhala nationalism had been existence at least from the fifth century if not from the time of Pandukabhaya), and no nationalistic party had evolved to satisfy the needs of the inherent nationalistic policies of the people. The Sinhala nationalism was brewing outside the political parties and the leaders of the movement had been the ordinary men and women who were the inheritors of the nationalistic independence movement of Keppitipola Disawa and others in 1817-18. The Ven. Bhikkus including those who were behind the Panadura Vadaya, Anagarika Dharmapla belonged to this movement and the names of the Bhasha Premis of the thirties, people such as L H Mettananda of Ananda Vidyalaya, though Colonel Olcott was of different category, come to the mind when one thinks of the nationalistic movement of the Sinhala people. It is clear that the SLFP that had its ears to the ground listening to these ordinary people changed its policy and adopted Sinhala only policy. The result of this change was manifested at the Minneriya by-elections, which the SLFP won with a handsome majority an year or two before 1956. The SLFP has been going along this nationalistic path winning the 1956 general elections and then the 1960 July general elections under Mrs. Sirimavo Bandaranaike. However the UNP credentials for nationalism (again not in the western sense) had not been lost under Dudley Senanayake, and even J R Jayawardhane subscribed to nationalism with his Dhrmishta Samajaya concept. The anti Sinhala nationalists tried to change the course of the SLFP by importing Chandrika Kumaratunge from her self exile in England, with the support of the west, and the leftists who by this time had become left out also joined the Chandrika bandwagon and some left out leftists including a few ministers in the present cabinet thought that the “ashcharya” had already begun. To cut a long story short all these dreams were short lived and the SLFP began a journey back to its nationalistic policies under Mahinda Rajapakse. However, on various occasions the President Mahinda Rajapakse had been under pressure from the west and India, and though he stood up to them very bravely, including the case when the west wanted him to allow Prabhakaran to escape with their assistance, in certain instances probably not knowing the strength of Sinhala nationalism may have talked of thirteen plus and LLRC report. As we have mentioned number of times LLRC is only a committee appointed by the government and its report is not a report of the government. The government is not compelled to implement the entire LLRC report, whatever some left out ministers of the cabinet and so called intellectuals in various fora may in their enthusiasm to satisfy their western masters and the associated thinking pattern, and the government has to listen to the Sinhala opinion before it listens to Navi Pillai and the rest in Geneva. The Sinhala opinion is against the full implementation of a report compiled by people who need grass for their feet, and the government should not betray the opinion of the Sinhala people to satisfy few ministers and the west. If these ministers and others are not given nominations at the next general elections they would not be able to come near the vicinity of the Parliament either as elected MPs or nominated MPs from the so called national list. They do not have an opinion of their own even to consider as they only repeat ad nauseam what they had learnt from their moth eaten Marxist or Socialist books which never became outdated for the simple reason that they were not “dated” anytime in the history of the last two centuries. The thirteenth amendment too has outlived and its time that the government rethinks its position of it in the light of Wignesawarn’s satisfaction at the decision by the Tamil Nadu government to release the murderers of Rajiv Gandhi though he was the official architect of the thirteenth amendment. Jayalalitha has different ideas and together with the TNA it is clear that now they are thinking of a greater Eelam with Tamil Nadu and the Northern province of Sri Lanka forming a mini Chola empire in South Asia with the assistance of the west. Some pundits may tell us of geopolitical realities (when there is no reality as such there cannot be geopolitical realities, except ambitions and expectations of political animals with political minds) and claim that in the presence of China the west would not support a divided India. However, the Tamils are the last to go against the west and the west knows that they are in control of Tamil politics whose nationalism is from top to bottom. The Rajapakse “regime” cannot ignore or betray Sinhala opinion and it is clear that at present the political parties other than the SLFP have no place in Sri Lankan politics as they are not nationalistic. The elections to the provincial councils in the absence of by-elections to the parliament serve as such and the opinion expressed at these elections is somewhat a resemblance of that expressed at the by-elections at Minneriya in the fifties. ඩී එස් සී උපාධිධාරී සේවාර්ජිත මහාචාර්ය අශෝක අමරතුංග මහතා මා වචන හා වචන යන මැයෙන් පළකළ ලිපිය තම පෙබරවාරි 19 වැනි දින ලිපියෙන් මුළුමනින් ම බැහැර කරන්නේ එහි කිසිවක් පවසා නැති බව සඳහන් කරමිනි. මගේ ලිපියෙහි මා ප්‍රකාශ කළේ අමරතුංග මහතා වචනවල තේරුම නොදැන බොහෝ මහාචාර්යවරුන් හා නිවේදකයන් මෙන් වචනවලින් දමාගසන බවත් ඔහුට තමා කියන්නෙ කුමක් ද යන්න පිළිබඳ ව අවබෝධයක් නැති බවත් ය. මගේ ලිපියෙහි කිසිවක් නැති බව ඒ මහතා කියන්නේ නම් එයින් ද ප්‍රකාශ වන්නේ ඔහුට ඇතැම් ලිපියක් කියවා අවබෝධ කරගැනීමට තරම්වත් ශක්තියක් නොමැති බව ය. ඉන්පසු ඒ මහතා විද්‍යාව යනුවෙන් ඇත්තේ එකක් ම පමණක් බවත් යුරෝපීය විද්‍යාඥයන් 15, 16, 17 වැනි සියවස්වල අතීතයේ පැවති විද්‍යාව පරිහානියට පත් වී නව විද්‍යාවක් ඇති වූ බව ලෝකයට පෙන්වීමට තැත්කරන බවත් ඒ නව විද්‍යාව “පැරණි විද්‍යාවට වඩා වෙනස් බව ද ක්‍රමවේදය තුළට රීතියකට යටත් වූ පර්යේෂණ ක්‍රම සහ ගණිතමය ක්‍රම ඇතුළු වී ඇති” බවත් ඔවුන් පෙන්වා දෙන බවත් සඳහන් කරයි. “ එහෙත් මේ තර්කය තමන් ලෝකයේ අන් ජාතීන්ට වඩා උසස් බව පෙන්වීමට කවදත් තැත් කරන ඔවුන්ගේ (යුරෝපයයන්ගේ) උපක්‍රමයක් පමණක් බව අප වටහා ගත යුතු ය” යනුවෙන් ද අමරතුංග මහතා පවසයි. මෙහි තර්කය යනුවෙන් කියැවෙන්නේ තර්කයකට නොවූවත් අමරතුංග මහතා කීමට තැත්කරන්නේ කුමක් දැයි අපට අවබෝධ කරගත හැකි ය. අමරතුංග මහතාට අනුව “එක ම ඉන්ද්‍රිය පද්ධතියකට කළ හැක්කේ එක ම ආනුභූතික ක්‍රියාකාරකම් ය. එක ම ස්වභාවධර්මයක් පිළිබඳ ව ගවේෂණයක යෙදෙන්නේ එක ම ස්නායු පද්ධතියක් විසින් නම් ක්‍රමවේදය ද එකක් ම විය යුතු ය….. …. … .. විද්‍යාත්මක සාක්‍ෂි සංස්කෘතියේ බලපෑමට යටත් නොවිය යුතු ය. නිරීක්‍ෂකයාගේ සංස්කෘතික පසුබිම ඊට බලපාන බව තෝමස් කූන් නම් දාර්ශනිකයා ප්‍රකාශ කරයි” මෙයට පසුව දීරඝ පිළිතුරක් දීමට බලාපොරොත්තු වෙමි. එහෙත් දැනට කරුණු දෙකක් පමණක් සඳහන් කරමි. ආනුභවික ක්‍රියාකාරකම් මනසෙන් ස්වායත්ත නො වේ. මනසක් නොමැති ව කෙරෙන ආනුභවික ක්‍රියාව කුමක් ද? අමරතුංග මහතාගේ ප්‍රශ්නවලට මුල ඔහු මනසේ ක්‍රියාකාරීත්වය නො තැකීම ය. සම්මුති නොවන අර්ථයකින් මනසක් පමණක් නොව ඉන්ද්‍රිය පද්ධතියක් ද නැතත් සම්මුති වශයෙන් අපට ඒ කිසිවක් නොසලකා සිටිය නො හැකි ය. සංස්කෘතිය බලපාන්නේ ඉන්ද්‍රිය පද්ධතියට (පංචෙන්ද්‍රියයන්ට) නොව මනසට ය. දැනුම නිර්මාණය කෙරෙන්නේ මනසෙනි. දෙවනුව කූන් නිරීක්‍ෂකයාගේ සංස්කෘතික පසුබිම ඊට බලපාන්නේ යැයි ප්‍රකාශ කරන්නේ යැයි අමරතුංග මහතා සඳහන් කරයි. මෙහි ඊට යනුවෙන් කියැවෙන්නේ කුමකට දැයි පැහැදිලි නැත. ඒ ඊනියා විද්‍යාත්මක සාක්‍ෂිවලට යැයි උපකල්පනය කරමු. එහෙත් මා දන්නා තරමින් කූන් එවැන්නක් කියා නැත. බටහිර විද්‍යාව හා සංස්කෘතිය අතර කිසියම් වූ ආකාරයක වුව සම්බන්ධයක් ඇතැයි කූන් ප්‍රකාශ කර ඇත්තේ කොතැනක දැයි සම්මානිත මහාචාර්යවරයා පුහුදුන් අපේ දැනුම වර්ධනය කිරීම සඳහාවත් ප්‍රකාශ කරන්නේ ද? බටහිරයන් තම දැනුම උසස් බව පෙන්වීමේ අරමුණෙන් බටහිර විද්‍යාවේ ඊනියා විද්‍යාත්මක විධික්‍රමයක් ඇති බව මා කියන්නේ අද ඊයේ නොවන බව මගේ ලිපි හා පොතපත කියවා ඇති අය දනිති. ඊනියා පර්යේෂණ බුදුන්වහන්සේගේ කාලයේත් බමුණන් කර ඇති බව මා පවසා ඇත්තේ වරක් දෙවරක් නො වේ. එහෙත් එයින් කියැවෙන්නේ බටහිර විද්‍යාව හා අනෙක් දැනුම් අතර වෙනසක් නැති බව නො වේ. බටහිර විද්‍යාව අනෙක් දැනුම්වලින් වෙනස්වන්නේ එහි පදනම් චින්තනය හේතුවෙනි. ඕනෑම දැනුමක් යම් චින්තනයක් මත පදනම් ව යම් සංස්කෘතියකට සාපේක්‍ෂව නිර්මාණය කෙරෙයි. එසේ නිර්මාණය කෙරෙන්නේ අවිද්‍යාව හේතුකොටගෙන ය. මා එලෙස සඳහන් කරන්නේ නිරාමාණාත්මක සාපේක්‍ෂතාවාදයෙහි සාරාංශය ය. මා විසින් දැනුමට එකතු කෙරී ඇති මූලික දැනුම එසේ කැටිකර දැක්විය හැකි ය. එය කූන් හෝ ෆෙයරාබන්ඩ් හෝ විසින් එකතු කෙරුණු දැනුමක් නො වේ. බටහිර විද්‍යාව පහළොස්වැනි සියවසේ බිහි වී ඉන් පසු වර්ධනය වූ ග්‍රීක යුදෙවු ක්‍රිස්තියානි චින්තනය මත පදනම් වෙයි. බටහිර විද්‍යාව පට්ටපල් බොරු වන්නේ මේ චින්තනය මත පදනම් ව නිර්මාණය කෙරෙන වියුක්ත (abstract) ප්‍රවාද මනසෙන් මවාගැනීමටවත් නොහැකි එහෙත් මනසෙන් නිර්මාණය කෙරෙන, බුදුන් වහන්සේට අනුව නම් හුදු පඥ්ඤත්ති (පැනවීම්) වීම නිසා ය. දැනුම් පද්ධතීන් අතර ඇති සමානකම් ලෙස අමරතුංග මහතා දකින්නේ බටහිරයන් පෙරදිග දැනුම් තම නව චින්තනය මත පදනම් ව යුදෙවු ක්‍රිස්තියානි සංස්කෘතියට අවශෝෂණය කිරීමෙන් ලබාගත් ප්‍රතිඵල ය. අමරතුංග මහතා සඳහන් කර ඇති පරිදි නොව බටහිර ගණිතය හෝ බටහිර භෞතික විද්‍යාව හෝ මගේ ඒකාධිකාරයක් නො වේ. එහෙත් ලංකාවේ විශ්වවිද්‍යාල තුනක බටහිර ගණිතය, විශේෂ හා සාධාරණ සාපේක්‍ෂතාවාද සහ ක්වොන්ටම් භෞතිකය ඇතුළු බටහිර ප්‍රවාදාත්මක (‍‍සෛද්ධාන්තික – theoretical) භෞතික විද්‍යාව උගන්වා ඇති මා ඒ විෂයයන් පිළිබඳ යමක් දන්නේ යැයි අදාළ බලධාරීන් තීරණය කර ඇත. (විශ්වවිද්‍යාල දෙකකින් ම මා කොන් වී ගියේ අනධ්‍යයන හේතු නිසා බව මට මහාචාර්යකම රැක ගැනීමට නොහැකි වී යැයි ප්‍රකාශ කරන අමරතුංග මහතා පිළිගන්නේ දැයි මම නො දනිමි.) මා අමරතුංග මහතාගෙන් මෙතෙක් ඉල්ලා ඇත්තේ එක ම එක දෙයකි. මගේ දැනුම දියුණු කරගනු සඳහා තන්තුවාදය, කළු කුහර (බ්ලැක් හෝල්), සාපේක්‍ෂතාවාදය ආදිය පිළිබඳ දේශනයක් හෝ දේශන මාලාවක් හෝ පවත්වන ලෙස ය. අද මම ඒ දේශන සඳහා තවත් කරුණු කිහිපයක් එකතු කිරීමට කැමැත්තෙමි. එකක් ගණිතය හා සම්බන්ධ ය. තවත් එකක් වෛද්‍ය විද්‍යාව හා සම්බන්ධ ය. වෛදික ගණිතය හා බටහිර ගණිතය අතර ඇති සමානකම් කවරේ දැයි අමරතුංග මහතාගෙන් දැන ගැනීමට මම කැමැත්තෙමි. තවදුරටත් වෛදික ගණිතය බොහෝවිට සූත්‍රවලින් දැනුම ප්‍රකාශ කරන්නේත් එය බොහෝ විට වියුක්ත නොව සංයුක්ත (concrete) වන්නේත් බටහිර ගණිතය වියුක්ත වන්නේත් ඇයි දැයි දැනගැනීමට ද මම කැමැත්තෙමි. වෛද්‍ය විද්‍යාව හා සම්බන්ධයෙන් මට අවශ්‍ය වන්නේ බටහිර වෛද්‍ය විද්‍යාව, ආයුර්වේදය හා පාරම්පරික සිංහල වෙදකම අතර ඇති සමානත්වය දැනගැනීමට ය. ඒ වෛද්‍ය ක්‍රම තුන ම එකක් යැයි අමරතුංග මහතා පවසන්නේ ද? එසේත් නැතහොත් ආයුර්වේදය හා සිංහල පාරම්පරික වෙදකම යන දෙකෙන් එකක් හෝ දෙක ම හෝ මිථ්‍යාවන් යැයි ඒ මහතා ප්‍රකාශ කරන්නේ ද? ශ්‍රී ලංකා (බටහිර) වෛද්‍ය පාලක සභාව දැනට දශක දෙකකට පමණ ඉහත දී කොළඹ විශ්වවවිද්‍යාලයේ දේශීය වෛද්‍ය ආයතනය සම්බන්ධයෙන් ඇති වූ ගැටළුවක දී කොළඹ විශ්වවිද්‍යාලයේ (බටහිර) වෛද්‍ය පීඨයේ බටහිර වෛද්‍ය විද්‍යාව පිළිබඳ සහතික ලත් මහාචාර්යවරුන්ට හා කථිකාචාර්යවරුන්ට දේශීය වෛද්‍ය ආයතනයේ ඉගැන්වීම තහනම් කළේ ය. එකල අමරතුංග මහතා විශ්වවිද්‍යාල පද්ධතියේ සේවය කළේ දැයි නො දනිමි. එහෙත් කොළඹ විශ්වවිද්‍යාලයේ සනාතන සභාවේ දී ද විශ්වවිද්‍යාලයීය ආචාර්ය සමිති සම්මේලනයේ දී ද වෛද්‍ය පාලක සභාව විශ්වවිද්‍යාල ස්වාධීනත්වයට එරෙහිව ගන්නා ලද යථොක්ත තීරණයට එරෙහිව සටන් කිරීමට අප කිහිප දෙනකුට සිදු විය. බටහිර වෛද්‍ය විද්‍යාව විසින් ආයුර්වේදය එයට සමාන හෝ පිළිගත හැකි හෝ වෛද්‍ය ක්‍රමයක් ලෙස නො පිළිගැනෙයි. බටහිරයන්ගේ උද්ධච්චකම ඇත්තේ බටහිරයන්ට පමණක් නො වේ. එහෙත් අවාසනාවකට මේ උද්ධච්චකම අද ඇතැම් ආයුර්වේද වෛද්‍යවරුන් අතර ද දැකිය හැකි ය. ඔවුහු සිංහල පාරම්පරික වෛද්‍යවරුන්ට කුඩම්මාගේ සැලකිල්ල දක්වති. බටහිර වෛද්‍ය විද්‍යාවේ ආධිපත්‍යය කෙතරම් ද යත් අද නිදහස් සෞඛ්‍ය සේවය බටහිර වෛද්‍ය ප්‍රතිකාරකම්වලට පමණක් සීමා වී ඇත. එය අපේ සාකච්ඡාවට අදාළ නැතැයි අමරතුංග මහතා කීමට ඉඩ ඇත. එහෙත් ආණ්ඩුව ආයුර්වේද වෛද්‍ය සායනවත් පාරම්පරික සිංහල වෙදගෙවල්වත් ජනතාව සඳහා නොමිළේ පවත්වාගෙන යෑමට ආධාර නොකරන්නේ බටහිර වෛද්‍ය විද්‍යාවට මෙන් පිළිගැනීමක් අනෙක් වෛද්‍ය ක්‍රමවලට නොමැති බැවිනි. ආයුර්වේදයට හා සිංහල පාරම්පරික වෙදකමට පිළිගැනීමක් නැත්තේ එහි ඊනියා විද්‍යාත්මක විධික්‍රමය නැති බවට මතයක් ඇතිකර ඇති බැවින් ද? අවසාන වශයෙන් පසුව දිර්ඝ ව පිළිතුරු දෙන තෙක් අමරතුංග මහතා බටහිර සංගීතය, රාගධාරී සංගීතය, කර්ණාටක සංගීතය, සිංහල සංගීතය, චීන සංගීතය අතර වෙනසක් දකින්නේ දැයි පවසන්නේ නම් මැනවි. එහෙත් එය බටහිර විද්‍යාවෙන් ඈත තිබෙන්නේ යැයි කිවහැකි බැවින් එය අමරතුංග මහතාට බරක් කිරීමට මම උත්සාහ නො ගනිමි. කෙසේ වෙතත් ඉහත සඳහන් සියලු උදාහරණවලින් මා පෙන්වා දීමට තැත් කරන්නේ මනස විසින් නිර්මාණය කෙරෙන දැනුම් පද්ධතීන් එකිනෙකින් වෙනස් බව ය. අපි දැන් නැවතත් පසුගිය සතියේ සාකච්ඡා කළ ප්‍රශ්න දෙකට ආපසු යමු. අවාසනාවකට දෙවැනි ප්‍රශ්නයට පිළිතුරු දීම තවත් පමා කිරීමට සිදුවෙයි. අපි ගෙදර යෑම හඳට යෑම හා පරළොව යෑම සමග මතුවෙන ආත්මවාදී ප්‍රශ්නය සාකච්ඡා කරමින් සිටියෙමු. මා යනුවෙන් පුද්ගලයකු නැති වුවත් එය මනසේ මායාවක් වුවත්, එය බුදුන් වහන්සේට ද අනුව පඤ්ඤත්තියක් (පැනවීමක්) මුසාවක් (එනම් බොරුවක්) වුවත් අපි ඒ සංකල්පය විවිධ අවස්ථාවල දී සාර්ථක ව යොදා ගන්නෙමු. නිවුටන්ගේ ගුරුත්වාකර්ෂණ ප්‍රවාදය ද එසේ ම ය. එය සිතෙන් මවා ගැනීමටවත් නොහැකි පට්ටපල් බොරුවක් පමණකි. එය ද අපේ (නිවුටන්ගේ) පැනවීමක් (පඤ්ඤත්තියක්) පමණකි. පොළොවට වස්තු වැටෙන්නේ ඇයි ද යන ප්‍රශ්නයට පිලිතුරක් අවශ්‍ය විය. ඒ පිළිතුර දුන්නේ නිවුටන් ය. අමරතුංග මහතා තම ලිපියකින් කියා තිබුණේ වස්තු වැටෙන්නේ පොළොවට ඇති ආකර්ෂණය නිසා බව ය. මේ සම්බන්ධයෙන් විවිධ අවස්ථාවල අමරතුංග මහතා දක්වා ඇති පරස්පර අදහස් ඉඩක් ලද විගස උපුටා දක්වමි. ඒ මහතා වරක් ගුරුත්වාකර්ෂණය ඇතැයි කීවා පමණක් නොව ඒ ඇති බව තට්ටු දොළහක ගොඩනැගිල්ලකින පැන දැනගත හැකි බවත් කීවේ ය. එහෙත් පසුව ඔහු ගුරුත්වාකර්ෂණය දැනෙන දෙයක් නොවේ යැයි කීවේ ය. පොළොවට වස්තු වැටෙන්නේ ඇයි ද යන ප්‍රශ්නයට විවිධ පිළිතුරු දිය හැකි ය. නිවුටන් හා අයින්ස්ටයින් සංකල්පීය වශයෙන් කිසිම සමානකමක් නැති පිළිතුරු දෙකක් දී ඇත. ඒ පිළිතුරු පැනවීම් (පඤ්ඤත්ති) පමණ ය. ඒවා පට්ටපල් බොරු ය. ඒ එක් බොරුවක්වත් සිතෙන් මවාගත හැකි නො වේ. නිවුටන්ගේ දුරෙහි සිදුවන ක්‍රියාව (action at a distance) සිතෙන් මබාගැනීමට අමරතුංග මහතාට හැකි ද? එසේත් නැතහොත් අයින්ස්ටයින්ගේ ස්ථානීය (local) අවකාශ කාල වක්‍රතාව (curvature) හා රීමාන් ආතානකය (Riemann Tensor) සිතෙන් මවාගැනීමට ඒ මහතාට හැකි ද? ඒ සංකල්ප පට්ටපල් බොරු වුවත් අපට ඒ ආධාරයෙන් හඳට රොකට්ටු යැවීමට, බුධ ග්‍රහයාගේ චලිතය විස්තර කිරීමට හැකි ය. මා නම් බොරුව යොදා ගෙන මට ගෙදර (ගෙදර කියන බොරුවට) යා හැකි නම් නිවුටන්ගේ ගුරුත්වාකර්ෂණ ප්‍රවාදය නමැති පට්ටපල් බොරුව යොදා ගෙන හඳට රොකට්ටු යැවීම අරුමයක් නො වේ. අමරතුංග මහතා මාර්ටින් වික්‍රමසිංහ මහතාගේ ලීලා සංඥාපනය ගැන සඳහන් කරයි. සංඥාපනයට අනුව විද්‍යාවන් තිබිය යුත්තේ එකකි. වික්‍රමසිංහගේ ලීලාව ගැන අපි පසුව කතා කරමු. There is supposed to be a problem in Sri Lanka. It is discrimination of Tamils by the Sinhala people in general and what is called the government of the latter or the Sinhala government. As a solution to the problem it had been suggested that power should be devolved to the Northern Province and the Eastern Province, which are described as the Tamil homeland, traditional habitats etc., of the Tamils in Sri Lanka. The so called problem had been “formulated” differently over time but in essence it has been discrimination of the Tamils by the Sinhala people. It is also said that problem started after the Sinhala Only Act in 1956, and the SLFP led by the Bandaranaikes and now by Rajapakse is responsible for creating and worsening the discriminations against the Tamils. As an answer to the important question why the Sinhala Buddhists should discriminate against the Tamils it is very often said that it is the result of Mahavamsa mind set whatever is meant by that term. Some pundits even go to the extent of equating Mahavamsa with Thripitaka (translated as the Three Baskets) and as such Sinhala Buddhists are supposed to have Chaturpitaka (four baskets)! Mahavamsa undoubtedly has conditioned the Sinhala people over the years, and together with the Visuddhimagga and Pali commentaries supposed to be written by Ven. Buddhagosha Thera (and probably other Bhikkus from Andra Pradesh and Sri Lank) from Andra Pradesh, with the Mahavira Bhikkus “supervising” the work, has been the main text along which Sinhala nationalism had been built in the academic world. (In fact Visuddhimagga very much above the standard of most of the Ph.D Theses written following the English university traditions after the nineteenth century could be considered as one of the best works done under “supervision”.) The other book that influenced the Sinhala people, mainly the common man, is the Jathaka Potha that was written much later. The Mahavamsa and the commentaries have been written circa fifth century and obviously there had been some reason(s) for writing of these texts more or less during the same time. They could not have been written against the Tamils as there were no permanent Tamil residents in the country at that time. There were occasional invaders from what is presently called South India but there was no reason to write the commentaries with the assistance of Bhikkus from Andra Pradesh against Dravidian invasions. The commentaries together with Thripitaka define what can be called the Theravada Bududahama or the Bududahama of the third council (sangyana) during Asoka’s time. I prefer to call this Bududahama, Asoka Bududahama or the Bududahama of the third council, and the Mahavamsa that ends with the reign of Mahasen, though the book was written much later, clearly establishes the victory of Mahavihara the center of Asoka Bududahama over Abhayagiriya, Jethavana and the other centers of what could be called non pure Asoka Bududahama. Mahasen demolished Mahavihara but later he was made to apologize to Mahavira Bhikkus, and rebuild it. Regarding Mahasen’s death, Mahavamsa says the king died after acquiring much pav (sin) and pin (merit). The Mahavamsa or the Vamsa of the Buddha is identified as the Vamsa of Asoka Bududahama, and the book written by Mahanama Thera gives prominence to the King Asoka of Dambadiva, though it is supposed to deal with the history (Vamsakatha) of Bududahama in Sri Lanka. Mahavamsa is clearly the Vamsakatha (history) of the Asoka Bududahama, and it establishes the “supremacy” of that sect over the other sects of Bududahama or other Bududahamas. However, Mahavamsa should not be considered as a book of history in the western tradition as no attempt has been made to write a history of Sri Lanka or the Sinhala nation. Ideally it should be treated as a Vamsakatha and nothing more. Mahavamsa and the commentaries together with Thripitaka, if at all can be considered as the texts of Asoka Bududahama, the Bududahama of victors over the other Bududahamas. It appears that politically and culturally (“doctrinally”) the Asoka Bududahama was under threat from the Madhyamaikas and Sauthranthikas not only in Sri Lanka but in Andra Pradesh and other parts of present day India, during this period, and at least in Sri Lanka the Asoka Bududahama had been able to defeat the others, though not decisively. It appears that the Asoka Bududahama decisively established its “supremacy” with the revival during the time of Weliwita Sri Saranankara Sanga Raja Thera, as probably the others had died a “natural death” as there was no patronage from anybody to revive those Bududahamas. The fact that there has been a book called “Vargapurnikava” copied during the last phase of the Sinhala kingdom reveals that other Bududahamas and Vamsakathas had been existence as late as that period. It can be stated that Mahavamsa if at all is not against Tamils or any other ethnic community, but is the result of attempts by Mahavihara Bhikkus to preserve Asoka Bududahama as against Madhyamikvada, Sauthranthikavada and Mahyana Bududahamas. The Mahavihara Bhikkus considered Asoka Bududahama as the “original” Bududahama and they were determined to protect that Bududahama, and Mahavamsa and the commentaries including Visuddhimagga have been written with that purpose in mind. Ven. Gnanaponika Thera in his “Anatta and Nibbana”, which I read in the Sinhala as translated by N T S A Senadheera, claims that Visudddhimagga had been careful to “interpret” Nibbana not as a Sunya Dhamma in order to distinguish Theravada (Mahavihara) from Sauthranthikas in order to avoid any criticisms from Mahayana sects. It is difficult to agree with the “interpretation” of Nibbana as given in Visuddhimagga, and I personally would have liked to see other Bududahamas flourishing in Sri Lanka in addition to Asoka Bududahama in what may be called the Shastriya Lokaya (Academia if I may use a term from the western tradition). In any event Sinhala Buddhagama as practiced in Sri Lanka is not scholastic or shastriya Asoka Bududahama of Mahavihara and one could see the Devagama of “Yakshas” and other gothras (not tribes in the way western academics use the term) blended with various Bududahamas, which had been taught in Abhayagiriya , Jethavana and other places. It is interesting to note that the Sinhala English Treaty of 1815 refers to Buddhagama and Devagama and not Buddhagama as such. Buddhagama and Devagama can be considered as the forerunner of present day Sinhala Buddhagama, which has a history going back to more than two thousand three hundred years if one believes in Vargapurnika. The Mahavamsa myth as propagated by the westerners, the Tamil racists, pundits of NGOs and the academia is itself is a myth coined by them as Mahavamsa is not a book written against the Tamils. It is an intra Buddhist “quarrel” between Mahavihara and the other centers such as Abhyagiriya and Jetavana, which comes to light when Mahavamsa is read with the Visuddhimagga and the commentaries, and those who should have any problem with Mahavamsa are not the Tamils but those who do not agree with Asoka Bududahama, and that again is confined to few people in the Shastriyia Lokaya. මා කොළඹ විශ්ව විද්‍යාලයට ඇතුලුවූ අවධියේ එහි විද්‍යාපීඨයේ වසරක් පසා පැවැත්වුනු නවකයින් පිලිගැනීමේ උත්සවය සුරා පැන් බාල්නැටුම් ඇසුරින් පැවැත්වුනු රාත්‍රී සංගීත සාදයක් විය. එක් වසරකදී මේඋත්සවයට දේශීය මුහුණු වරක් ලබාදිය යුතුයැයි එහි විද්‍යා පීඨ ශිෂ්‍ය සංගමයවිසින් තීරණය කෙරිනි. උත්සවයෙන් සුරා පැන් ඉවත් කෙරුනු අතර රාත්‍රී භෝජනසංග්‍රහය ශාලාවක වෙනුවට එළිමහනේ පැවැත්වීමට යෙදිනි. ඊලඟට ප්‍රශ්ණය වූයේවිනෝදාස්වාදය සඳහා කුමක් කල යුතුද යන්නය. බොහෝ කල්පණා කලද අවස්ථාවට උචිතබාල් නැටීමට විකල්පයක්වූ නමුත් දේශීයත්වයක් ඇති ක්‍රියාකාරකමක් සිතා ගතනොහැකි විනි. අවසානයේ ගිණි කෙලි නැටුම් සංදර්ශණයක් පවත්වමු යැයි තීරණය වූයේකුමක් හෝ කල යුතුවුනු බැවිනි. ගිණි කෙලි නැටුමට ශිල්පියා කැඳවාගෙන ඒමටභාරදී තිබුනේ මටත් මගේ මිතුරෙකුටත්ය. එදා ඒ ශිල්පියා කොළඹට නුදුරු ගමකතොවිලයක් කිරීමට යොදාගෙන තිබුනු බැවින් ඔහුගේ වැඩ අවසන් වන තෙක් තොවිලයනරඹා අවසන්වූ විගස අපි කපු මහත්තයාත් බෙර කරුත් කැටුව කොළඹ විශ්වවිද්‍යාලයට ගියෙමු. ගිණි කෙලි නැටුම ඉමහත් ප්‍රතිචාර මැද ජයට සිදු කෙරුනුමුත් ඔහුගේ හැසිරීම් විලාසයෙන් අපි දුටුවේ තොවිල්පලේ හුන් පෞඪ මිනිසා නොවබයාදු කුලියට නටන නැට්ටුවෙකි. ඔහුට වේදිකාවල සංදර්ශණය සඳහා කුලියට නටාපුරුද්දක් නොතිබුනු බව පෙනිනි. අප ඉදිරියේ නටන්නට සලස්සවා අපි ඔහුගේගරුත්වය කෙලෙසූ බව අපට එවෙලේ වැටහුනි. තොවිල් පලේදී වැදගත් කමක් ලැබෙන්නේ කරන තොවිලයට හෝ ආතුරයාටමිස නරඹන්නන්ට නොවේ. තොවිල් පලේදී ලොක්කා කපු මහත්තයාය. කොළඹ විශ්වවිද්‍යාලයේදී ඔහුගේ ලෝකය කණපිට හරවා අපි ඔහුව සොක්කෙක් කෙරුවෙමු. අපි බටහිරසංස්කෘතියේ දේවස්ථානයක් තුල සිංහල සංස්කෘතිය බාල්දු කෙරුවෙමු. කණගාටුදායකඑය වූයේ දේශීයත්වය අගය කිරීමට ගොස්වීමය. ඉන් පෙන්නුම් කෙරුනේ වෙන කිසිවක්නොව අපේ නොහැකියාවය. අපට අපේ සංස්කෘතිය තුල නිර්මාණ කිරීමට නිපුණත්වයක් නැත. අපිදෙමව්පියන්ගෙනුත් සමාජ අශ්‍රයෙනුත් සංස්කෘතික අභාශය ලබන බව සැබෑය. නමුත්විධිමත් අධ්‍යාපනයෙන් ලබාදෙන සංස්කෘතික අභාෂය ඒ සියල්ල අභිබවා යයි.අවාසනාවකට දේශීය ශිල්පීය හෝ ශාස්ත්‍රීය පුහුණවක් ලබනු වෙනුවට බටහිරඅධ්‍යාපනයක් ගිරවා දමන උපාධිදාරීන්ට දේශීය දැනුම සම්බන්ධයෙන් අත්වෙන්නේ සෘණඅගයකි. ඔවුන්ට කල හැක්කේ එක්කෝ සිංහල බෞද්ධ සංස්කෘතිකාංග ගෙඩි පිටින් බදාගැනීමය එසේ නැත්නම් ඒවා බටහිර සංස්කෘතියට අවශෝෂණය කර දීමටය. මේ දෙකින්මසිදුවන්නේ අවැඩකි. තේ පානය මෙන්ම පීරිසි කෝප්පද අපට ඉංග්‍රීසීන්ගෙන් ලැබුණුදායාදය. අද කෙසේ වෙතත් කලකට ඉහතදී තේ බීමේ පිලිවෙත ඉංග්‍රීසීන්ට වැදගත්සංස්කෘතිකාංගයක් විය. නමුත් අපේ ගැමියෝ ඉංග්‍රීසීන්ගේ ගාම්භීරත්වය නොසලකාපීරිසිය තේ නිවීම සඳහා යොදාගනිමින් තේ බීම අපේ කරගත්හ. නමුත් අපි අද කරන්නේතේ කෝප්පයේ අපේ සංස්කෘතික ලාංඡන ඇලවීමය. මෙයින් කෙරෙන්නේ ඉංග්‍රීසීන්ගේ තේබොන සංස්කෘතියට තව මුක්කුවක් ගසා එය සවිමත් කිරීම මිස අපේ කමක් රැකීමනොවේ. ඊළාම් යුධය දිනීමෙන් පසු දෝරේ ගලා හැලුනු අදටත් හැලෙන ව්‍යාජජාතිකත්වයෙන් සම්පුර්ණයෙන්ම පාහේ කෙරන්නේ බටහිර සංස්කෘතියට සිංහල බෞද්ධකමඅවශෝෂණය කර දීමය. එසේකරමින් අපි බටහිරත්වයේ ගාම්භීරකම ආරුඪ කර ගැනීමටව්‍යවර්ත උත්සාහයක යෙදෙන්නෙමු. මේ කාර්යයට විශේෂ උවමණාවක් ඇත්තේ මෙරට උගත්මධ්‍යම පංතියටය. නමුත් දේශීය දැනුම උගත් ගැමියන්ට බටහිරුන්ගේ මොනකෙහෙම්මලක්වත් අවශ්‍ය නැත. ඔවුන්ට අපේ දේ රැක ගැනීමටත් අපේ නොවෙන දේ අපේ කරගැනීමටත් ස්වාධීනත්වයකුත් හැකියාවකුත් ඇත. ඒ නිසා සිංහල බෞද්ධ සංස්කෘතියගැන කැක්කුමක් ඇති බටහිර උගතුන් සංස්කෘතිය රැකීම සඳහා වැඩ කරද්දී තමන් කරනදේ පිළිබඳ මනා අවබෝධයකින් යුතුව ක්‍රියා කල යුතුවේ. හෙළ ගොවිතැන රැකෙන්නේ ගොවිකම දන්නා ගොවිකම ජීවන ක්‍රමයකරගත් මිනිසුන් නිසාය. වෙදකමද එසේය. දේශීය කලා සහ අනිකුත් ශිල්ප ගැනද එයසත්‍යයකි. බුදු සසුණ රැකෙන්නේද උගත් භික්‍ෂූණ් වහන්සේලා නිසා මිස ගිහියන්නිසා නොවේ. ජීවත්වීම සඳහා බටහිර රැකියාවල් කරන නූගත් උපාධිදාරීන් මේ විවිධක්‍ෂේත්‍ර කළමණාකරණය කිරීමට යාම සුදුසු නොවේ. ඉන් නොසිතාම අවැඩක් වීමට බොහෝඉඩ කඩ ඇතැයි මම සිතමි. විවිධ ක්‍ෂේත්‍රතුල දේශීය දැනුම උගත් වැඩිහිටි පරම්පරාවක්තවම අප අතර ජීවත් වෙති. වැඩක් ඇති වැඩක් කල හැක්කේ ඔවුන්ටය. තව වසරවිස්සකින් තිහකින් ඒ පරම්පරාවත් ඒ දැනුමත් අපෙන් ගිලිහීමට පෙර ඔවුන්ට තමදැනුම ව්‍යාප්ත කිරීමටත් නව නිර්මාණ කිරීමටත් අවශ්‍යය ඉඩ කඩ සලසාදිය යුතුය.උදාහරණයක් වශයෙන් අද රජරට ප්‍රදේශවල වකුගඩු රෝගයෙන් මිදී පාරම්පරිකක්‍රමයට ගොවිතැන් කිරීමට උත්සාහ කරන ගොවිමහතුන්ට තමන්ගේ කාරිය කරගෙන යාමටදේශපාලන රැකවරණයක් අවශ්‍යය. ඔවුන්ට ඒ දේශපාලන ශක්තිය නැත. නමුත් ගොවීන්ටවෙදුන්ට භික්‍ෂූන්ට නැති යම් දේශපාලන හයියක් මෙරට බටහිර අධ්‍යාපනයේ ඉහලටගිය අයට හිමිය. කැක්කුමක් ඇති උපාධිදාරීන් (අපේක්‍ෂකයින් නොවේ) කල යුත්තේතමන් සතු දේශපාලන බලය දේශීය උගතුන්ගේ අවශ්‍යතාවයට අනුව මෙහෙයවීමය. උපාධිදාරීන්ට කරනවා නම් ඊටත් වඩා වැදගත් වැඩක් ඇත. ඒහැකිනම් අර අපේ ගැමියන් සුද්දාගේ තේ බීමේ චර්යාවට පයින් ගසා තේ නිවන්නපීරිසි යොදා ගත්තා සේ තම තමන් කුලියට වැඩ කරන වානිජ, මාධ්‍ය, අධ්‍යාපන, පරිගණක, තාක්‍ෂණික වැනි ක්‍ෂේත්‍රවලින් සුද්දා එලවීමය. නැත්නම් ඒ ඒක්‍ෂේත්‍රයේ බටහිර සංස්කෘතියට ඇති ආධිපත්‍යය බිඳ දැමීමය. සුද්දා එලවීම යනුතේ කෝපයේ සිංහල බෞද්ධ ලාංඡනයක් අලවා දෙපැත්තම බේර ගැනීම වැනි වැඩක් නොවේ.අප රටේ ඇති බටහිර ආයතන වලින් කෙරෙන වැඩ සහ වැඩ කරන ආකාරය අපේ කර ගැනීමය.අපේ කර ගන්ට බැරි නම් අඩුතරමින් එහි බටහිර සංස්කෘතියේ ආධිපත්‍යයවත් බිඳදැමිය යුතුය. මේ රටේ සිංහල දෙමළ කථාකරන මිනිසුන්ට පාරිභෝගික භාණ්ඩ විකුණනආයතනයක් තුල සම්පූර්ණයෙන් සිංහලෙන් හෝ එසේ නොහැකි තැනක දෙමළෙන් පමණක් වැඩකටයුතු කිරීමට ක්‍රියාකල නොහැකිද? ඒ සඳහා ඒ ආයතනවල ඉහල තනතුරු දරනකැක්කුමක් ඇති උපාධිදාරීන්ට යමක් කල නොහැකිද? බටහිර සංස්කෘතිය එහි උගතුන් ආරක්‍ෂා කරයි. උපාධිදාරීන්ටපැවැත්මක් ඇත්තේ මේ ආයතන වල ඇති බටහිර සංස්කෘතිය නිසා බව කිව යුතු නැත.නමුත් මේ ආයතනවලින් සුද්දා එලවිය හැක්කේද උපාධිදාරීන්ට මිස ගොවීන්ට වෙදුන්ටහෝ භික්‍ෂූන්ට නොවේ. උපාධිදාරීන් ඒ සඳහා ඉදිරිපත් වෙනවාද? සිංහල ජාතිකවාදීන් බොහෝ දෙනකුට දෙමළ ජාතිවාදී ප්‍රශ්නය නොතේරීම ජෙනීවා පැරදවීමට ඇති ප්‍රධාන බාධාව බවට පත් වී ඇත. මේ බොහෝ දෙනකු අප ඉදිරිපත් කරන මතයට විරුද්ධ වන්නේ ඉතිහාසය හා සමස්තය ගැන හැදෑරීමකින් තොරව ය. ප්‍රශ්නය ඊනියා නිජභූමි ප්‍රශ්නයක් බවට මතයක් ඉදිරිපත් කිරීමේ වෑයමක් ප්‍රබුද්ධයන් යැයි කියාගන්නා අතර වෙයි. එක් ප්‍රබුද්ධයකුට අනුව දෙමළ ප්‍රශ්නය ගැන ඉදිරිපත් කර ඇති නිවැරදි මතය නිජභූමිය පිළිබඳ ප්‍රශ්නය ය. මොවුහු දෙමළ ජාතිවාදය පිටුපස ඇත්තේත් එය මෙහෙයවන්නේත් එංගලන්තය ප්‍රධාන බටහිර රටවල් බවත් දෙමළ ජාතිවාදය යොදා ගැනෙන්නේ බෞද්ධ සංස්කෘතීන් හා චින්තන නැතිකිරීමට බවත් නො පිළිගනිති. ජෙනීවාහි දී ඊනියා මානව අයිතිවාසිකම් කඩකිරීම් පිළිබඳ ප්‍රධාන යෝජනා ඉදිරිපත් කෙරෙන්නේ ශ්‍රී ලංකාව, මියන්මාරය හා උතුරු කොරියාවට විරුද්ධව ය. ඒ රටවල් කිනම් අරථයකින් වුව ද බෞද්ධ රටවල් ය. උතුරු කොරියාව බෞද්ධ නොවේ යැයි ප්‍රබුද්ධයකු පැවසීමට ඉඩ ඇත. එහෙත් අප දන්නා කරුණක් නම් පසුගිය දශක කිහිපය තුළ දකුණු කොරියාව සංස්කෘතික හා ආගමික වශයෙන් ක්‍රිස්තියානි/කතෝලික වී ඇති බවත් උතුරු කොරියාව එසේ වී නොමැති බවත් ය. ඉහත කී රටවල් තුන අතරෙන් මියන්මාරයට විරුද්ධව ගෙනෙන යෝජනාව සැර බාල කර ඒ රටේ ද අනුමැතියෙන් ගෙනෙන එකඟතා යෝජනාවක් බවට පත්කර ඇත. අවුන් සා සු කී යොදා ගැනීමෙන් බටහිර රටවලට මියන්මාරය යම් ප්‍රමාණයකට මෙල්ල කිරීමට හැකි විය. එහි දී බටහිරයෝ ආර්ථික සම්බාධක ද යොදාගත්හ. එහෙත් ලංකාවේ එවැනි තත්වයක් නැත. සු කී වෙනුවට බටහිරයන් ලංකාවේ දී යොදා ගැනීමට උත්සාහ කළේ චන්ද්‍රිකා කුමාරතුංග ව ය. එහෙත් එය අසාර්ථක විය. අද බටහිරයන්ට සුදුසු නායකයකු ලකොවෙන් සොයා ගැනීමට නො හැකි ය. එබැවින් ඔවුහු ම ලංකාවට එරෙහි ව සෘජුව ම ක්‍රියාත්මක වෙති. කැමරන් විය යුතු පරිදි ම එහි නායකත්වය දරන අතර ඔහුට ඔබාමාගේ හා ඇමරිකානු රාජ්‍ය දෙපාර්තමේන්තුවේ සහාය නොමඳ ව ලැබෙයි. දෙමළ ජාතිවාදය ඇතිකිරීම පිළිබඳ කතාව ලන්දේසීන් කරා දිව යන අතර වත්මන් ස්වරූපයෙන් එය පවතින්නේ දහනවවැනි සියවසේ මුල් දශකවල ඉංගිරිසින් විසින් ඇතිකරන ලද ව්‍යවස්ථාදායක මණ්ඩල කාලයේ සිට ය. එහෙත් අවාසනාවකට බොහෝ සිංහලයන්ට වියුක්ත ව (ඉංගිරිසියෙන් නම් ඇබ්ස්ට්‍රැක්ට්) සිතන්නට බැරි ය. (නො) දත් දොස්තරලාට වියුක්තය යන වචනයවත් නො තේරෙයි. බොහෝ දෙනාට සමස්තය දැකිය නො හැකි ය. වියුක්තව නොසිතා සාධාරණීකරණයට (පොදු බව දැකීමට) ඉඩක් නැත. මේ සියල්ල ග්‍රීක යුදෙවු ක්‍රිස්තියානි චින්තනයෙහි අංග ය. අපට ඒ නුහුරු ය. එසේ වුවත් පෘතුගීසීන්ට විරුද්ධ ව අප ඔවුන්ගේ කාල තුවක්කු නිෂ්පාදනය කර ඔවුන්ට එරෙහි ව යොදාගත් අයුරෙන් අද දවසේ අපට ඔවුන්ගේ වියුක්ත චින්තනය යම් ප්‍රමාණයකට වුව ද යොදාගත යුතුව ඇත. අප දෙමළ ජාතිවාදය පිටුපස හා ඉදිරිපස බටහිරයන් දකින්නේ වියුක්ත ව සිතීමෙනි. බටහිරයන් ලංකාවේ පමණක් නොව ඉන්දියාවේ ද දෙමළ ජාතිවාදය අපට විරුද්ධව යොදාගන්නා බව පසුගිය දා රජිව් ඝාතනයේ වැරදිකරුවන් නිදහස් කිරීමට තමිල්නාඩු ආණ්ඩුව ගත් තීරණයෙන් ද පැහැදිලි විය. එහි දී බටහිරයෝ ඉන්දීය ශ්‍රෙෂ්ඨාධිකරණය පමණක් නොව ගාන්ධි පවුල ද යම් ප්‍රමාාණයකට යොදාගත්හ. ඔවුහු සමාවදීමට (ඔවුහු කිසි විටෙකත් සමාව නො දෙති. එහෙත් අනෙක් අය ලවා ඒ දේවගතියක් යැයි කියන්න කරවති) ගාන්ධි පවුල ද යොදාගත්හ. රජිව් ගාන්ධිගේ දුව ප්‍රියංකා තම පියාගේ ඝාතකයා වූ නාලිනී බැලීමට හිරගෙදරට ගියා ය. ඉතාලි කතෝලික සම්භවයක් ඇති සෝනියා ද ඝාතකයන් කෙරෙහි අනුකම්පාවක් දැක්වී ය. ඝාතකයන්ගේ අභියාචනයක් සලකා බැලීමට අධිකරණය බොහෝ කලක් ගත්තේ ය යන පරිසිද්්ධිය (ඉංගිරිසියෙන් නම් ෆැක්ට්) මත පදනම් ව ඉන්දිය ශ්‍රෙෂ්ඨාධිකරණය වැරදිකරුවන්ගේ මරණීය දණ්ඩනය ලිහිල් කර ජීවිතාන්තය දක්වා සිරදඬුවමක් බවට පත්කළේ ඔවුන් නිදහස්කළ හැකි බවට තමිල්නාඩු ආණ්ඩුවට ඉඟියක් ද කරමිනි. ඉහත සඳහන් කළ පරිසිද්ධිය කිසි බරක් නැති විහිළුවක් පමණක් වුවත් සමාව දීම සඳහා මතයක් දේවගති ඇති ඉන්දිය ජනකොටසක් අතර ඇතිකර තිබිණි. ඝාතකයන් නිදහස් කිරීම පිළිබඳ ව තමන් සතුටු වන බව මෙරට හිටපු ශ්‍රෙෂ්ඨාධිකරණ විනිශ්චයකරුවකු වූ ද වත්මන් උතුරු පළාත් මහා ඇමති වූ ද විග්නේෂ්වරන් ප්‍රකාශ කිරීමෙන් විනිසුරුවන්ගේ තීන්දු ගැන ද අපට යම් අවබෝධයක් ලබාගැනීමට හැකි ය. මොන ප්‍රකාශ කළත් විග්නේෂ්වරන්ට ආනන්දී සමග තරග කළ නො හැකි බව ඔහු තේරුම් ගත යුතු ය. කෙසේ වෙතත් ඉන්දිය ආණ්ඩුව පමා වී හෝ මෙහි බරපතළකම තේරුම් ගෙන ඇත. එහි දී රාහුල් ඝාන්ධි තමිල්නාඩුවේ තීරණය පිළිබඳ තම කෝපය ද පලකර ඇත. තමිල්නාඩුවේ ක්‍රියාකලාපය හා ශ්‍රෙෂ්ඨාධිකරණ තීන්දුව ඔවුන්ගේ ම ක්‍රියා ලෙස අපි නොසලකමු. අප මෙහි දී තළියේ කිඹුලන් දකින්නේ යැයි කිසිවකු කියනු ඇත. තළියේ කිඹුලන් නැතිවුවත් පොළඟුන් ඇත. නන්දිකඩාල් කලපුවේ දී කොටින් පරාජය කිරීමෙන් පසුව ද දෙමළ ජාතිවාදයට මෙතරම් ශක්තියක් ඇත්තේ නිජභූමි සංකල්පයක් නිසා නොව බටහිරයන් දෙමළ ජාතිවාදය පිටුපස හා ඉදිරිපස ඇති බැවින් ය. එහෙත් නිජභුමි සංකල්පයට එරෙහිව අප සටන් නොකළා නො වේ. ඒ බව ගුණමකුවන් හැරෙන්නට සෙස්සෝ දනිති. යාපනයේ ඉතිහාසය ගැන අධ්‍යයනය කිරීමට ඒ ඇතැමුන් යොමු වූයේ කෙසේ ද යන්න පවා ඔවුන්ට අද වන විට අමතක වී ඇත. ගුණමකුවන්ට කෙසේ වුවත් සමස්ත ප්‍රශ්නය දැකීමට අපට හැකිවිය යුතු ය. අපට ජෙනීවා පැරදවිය හැක්කේ සමස්ත ප්‍රශ්නය දැකීමෙන් පමණකි. අප රට සම්බන්ධයෙන් ගත්කල අද ඇත්තේ සිංහල බෞද්ධ සංස්කෘතිය හා චින්තනයත් ග්‍රීක යුදෙවු ක්‍රිස්තියානි චින්තනයත් යුදෙවු ක්‍රිස්තියානි සංස්කෘතියත් අතර සටනකි. එහි දී බටහිරයෝ විසිරුණු දෙමළ ජනයාට, පඬියන්ට, රාජ්‍ය නොවන ගැත්තන්ට, ජඩමාධ්‍යවේදීන්ට අමතරව මෙරට ඇතැම් කතෝලික හා ක්‍රිස්තියානි පූජකයන් පල්ලි නිකාය හා පස්ගව (පස්වග නොවේ) මහණුන් ද යොදා ගනිති. අප ඉදිරියේ ඇත්තේ ජෙනීවා යෝජනාව පරාජය කිරීම පිලිබඳ ප්‍රශ්නය පමණක් නො වේ. අපට ජෙනීවා සම්ප්‍රදාය පරාජය කිරීමේ කාර්යභාරය ද වෙයි. ජෙනීවා යෝජනාවට කුමක් වේ දැයි නිශ්චිත ව කිව හැකි නො වේ. යෝජනාව පරාජය කිරීමට අප බටහිර නොවන රටවල සහාය පැතිය යුතු ය. එහෙත් එයටත් වඩා ජෙනීවා පරාජය කිරීමට අප උත්සාහ දැරිය යුතු ය. Who won the so called second world war? Nobody would claim that it was Japan, Germany or Italy and nobody wanted Churchill to discuss with the rump Nazis or the Japanese emperor and divide the world Germans and the Japanese wanted. There were no human rights groups that wanted the Nazis to be freed from all the inhuman activities they were involved with. No human rights group charged Churchill or anybody else in the western governments of human rights violations during the war, though it is known that the Americans decided to bomb Hiroshima and Nagasaki AFTER the war had been won by the Anglo Saxon countries and Soviet Union. It is also said that England killed hundred thousands to end the war quickly without prolonging it. If there was any discussion it was between those who won the war, namely the Anglo Saxon countries and the Soviet Union, on the division of the world between them. There was a clear winner of the war and to date England or USA has not been accused of abusing powers. England may have had to give independence to some Asian countries as a result of the second world war but the USA and England still rule the world including the said Asian countries. Leave alone the wars of others what about the “wars” we had in Sri Lanka. The invaders starting with Elara, Dhatiya Pheetiya during the Dhathusena days, then the Maghas, Cholas, the Portuguese, the Dutch and worse the English had been involved with destruction of lives property and more importantly the way of life of the people by force, as in the case of conversions by force or by giving bribes in the form of privileges, jobs in the professions but no charges of human rights violations have been brought against any of them. Though some countries have successfully claimed compensation from the colonials, Sri Lankan governments have not taken any action at least against the European countries as there is enough evidence of such destruction against those countries. I am more interested in the knowledge we possessed and stored in the ola leaf books, and other artifacts as stored in the British Museum and other places. Now I do not consider there was a war in Sri Lanka in the seventies, eighties or later in the twenty-first century. There was no war between the Sri Lankan government and the JVP or a war between the former and the LTTE. The JVP had taken up arms against the state on two occasions in the name of Marxism relative to that party and they were interested in establishing socialism whatever it meant to them. They were not agents of any foreign power, though there were stories on North Korea supporting them in 1971. However North Korea did not take up the issue of human rights of the JVPers after the Sri Lankan government was able to defeat the “revolution” with the support of the western countries. In 1989-92, as well, there were no human rights issues against the Sri Lankan government or the armed forces, and it cannot be said in the seventies it was due to the government taking up the Manmperi murder. It should be emphasised that in the seventies Sri Lanka had a SLFP led coalition as now, and the west was interested in their way of life continuing in the country. The west most probably considered the JVP revolt as a threat against their system and as such supported the Sri Lankan government to suppress it. I am not condoning the actions of the JVP either in the seventies or the eighties, but it can be said that the government won the “war” without leaving any residues in the form of human rights in the eyes of the westerners nor the human rights people all over the world. It has to be mentioned that as far as the revolts of the JVP were concerned no pundit here or abroad referred to a war between the Sri Lankan government and the JVP. There were no discussions, discourses on post war or post conflict situation and no American state department personnel or English Prime Ministers came to Sri Lanka for the specific purpose of discussing human rights issues. The non aligned summit was held in Colombo few years after the first JVP revolt and the Indian leaders were more than willing to participate in the proceedings. No leader of any country behaved as a bull in a China shop, the way David Cameron put up a “show” last year, this time a few years after the defeat of the LTTE, and Mrs. Bandaranaike and the SLFP though not liked by the western countries was a lesser threat to the western system than the JVP at least in the eyes of the west. The JVP did not challenge the sovereignty of the nation and all that they wanted was a change in the system whether we agreed with them or not. Even if the leadership of the “Marxist” JVP may not agree more than ninety five percent of the JVP members were Sinhala Buddhists, and for the west it was the Sinhala Buddhism in the JVP that was a bigger threat to them than the Sinhala Buddhism in the SLFP. None of the pundits wanted the government to have any discussion with the JVP leaders on what should be given to the JVP as a reconciliation. There were no discussions on reconciliation and truth commissions, LLRC reports not to mention Darusman and Pillai reports or on implementations of certain proposals to meet the demands of the JVP. The SLFP led coalition in the true Sinhala Buddhist tradition on their own had implemented a rehabilitation programme without any support of the human rights people who in the final analysis work for a fee. However with the defeat of the LTTE everything has changed. The LTTE terrorism is projected as a liberation movement and the humanitarian operations are now considered to be a war between the Sri Lankan government and the LTTE. Though the LTTE was defeated convincingly in the Nandikaddal Lagoon in 2009 it is not considered as a defeat. Human rights activists are having a field day both literally and literary, and the pundits are engaged in a never ending discussion, sorry discourse, on post war situation. Recently a few ministers known for “leftist” ideas and few Tamil racists and “intellectuals” (there are no intellectuals in Sri Lanka) got together to request the Sri Lankan government to implement the 13th amendment and be excused from charges on violation of human rights. It is clear that human rights is a bogus issue and the real concern of the west and Jayalalitha and the Congress is giving so called rights of the Tamils as envisaged by the Tamil racist movement. It is reported that the Tamil Nadu government is going to free seven convicts of the Rajiv Gandhi murder case. It is a pity that the naval rating who hit Rajiv Gandhi with his rifle had to be imprisoned. It may be that murdering a Prime Minister is a lesser offence than hitting a Prime Minster with a riffle, and I hope the human rights activists would take up the case of the naval rating and proceed with a courts case for compensation for him in the light of Tamil Nadu government to free seven convicted of murder of Rajiv Gandhi. The so called war between the LTTE and the government has not ended in Nandikadal for the simple reason it was not a war between those two parties. It is a conflict between the Judaic Christian culture of the west and the Sinhala Buddhist culture that has been in operation from 1506. The “war” has not been won by the Sri Lankan government and Cameron is now directly involved in the tussle to defeat Sinhala Buddhist culture. The demands of Tamil racism should have been thrown into the Nndikadal Lagoon in May 2009 as the demands of the Nazis were, as the “war” is also a political solution. There should have been no discussion on the 13th amendment after Nandikadal but since Judaic Christian culture and the Greek Judaic Christain Chinthnya, the main enemy of Sinhala Buddhism has not been defeated yet we will have to face Genevas in time to come in spite of the military victory, which in essence was the political solution to the Tamil racist problem. LTTE and Tamil racism unlike the JVP fight against the sovereignty of the nation, as agents of the west. Apparently there are only three countries that will have to face substantive resolutions in Geneva in March, and all of them Sri Lanka, Myanmar and North Korea happen to be Buddhist countries of one yana (vehicle) or the other. Of the three countries Myanmar has been “disciplined” after continuous application of pressure including economic sanctions and the country has agreed for a so called consensual resolution. In the exercise of “disciplining” Myanmar the western Christian countries had Aung San Suu Kyi as their agent, but in Sri Lanka and North Korea they do not have such a leader who could effectively challenge the relevant “regime” and the west has to depend on so called international pressure. As we have said often what we experience today is a clash between the Judaic Christian culture and the Islamic and Buddhist cultures. The Islamic culture is more powerful as a military power and also as a political force and the Judaic Christian cultural hegemony has concentrated on two Buddhist countries this year. It is very likely that in Sri Lanka the west can depend on a more westernized elite group especially in education than in North Korea, and that in the latter there is not so much of a discussion on the impending resolution in the media. The Sri Lankan educated people are obsessed with Geneva and most of them seem to believe that their future would be decided in March in Geneva. It is unfortunate that free education in Sri Lanka has produced a western educated group irrespective of the medium of instruction, which depend on so called analysis of western intellectuals echoed by the local pundits. If not for the so called uneducated people in the country, Sri Lanka would have agreed to any suggestion by the Judaic Christian west without even critically thinking of what is taking place. This is one of the reasons why we have to defeat the hegemony of the Judaic Christian Culture especially in the sphere of knowledge. Edward Said in his Orientalism published in 1978 concentrated on what is known as post colonialism by the western intellectuals, described how an Eurocentric view of the Islamic world and the orient in general misrepresented oriental culture. The Orient of the westerners was something that the western intellectuals created and not the orient of the people living in that part of the world. Said was a Professor in English at an American university and he was accepted by the western intellectuals in general. Said also described a relativity of knowledge, his emphasis being on how the west, meaning of course the western intellectuals, saw the orient. It is nothing but the Orient relative to the western intellectuals, and we could say that it was the Orient created relative to the Judaic Christian culture based on the Greek Judaic Christian (GJC) Chinthanaya. Said was accepted by the western intellectuals in general for the simple reason that in spite of his criticism he was also a western intellectual. Said accepted the GJC Chinthanaya and also the so called methodologies adopted in the western intellectual world, which included the western scientific method and the Aristotelian logic. The term post colonialism, a creation of the western intellectuals hide the fact that western Judaic Christian colonialism has not ended. The present day western intellectuals very often use the prefix post in describing phenomena, as for example in the case of post colonialism and post modernism, and by that usage one is assured that colonialism and modernism and other such phenomena have ended though it is not the case. Said described one form of relativism of western knowledge, without challenging the basis of such knowledge. The sociologists in the west have come out with theories on relativity of knowledge without going into the foundations of western knowledge. It was a relativity of “sociology” based on the GJC Chinthanaya and the western intellectuals had no problem with the relativities of Said or others. Except in the case of Feyerabend who challenged the so called scientific method in his book “Against method”, and who was not recognized by the western intellectuals, the others including Kuhn who wrote “The structure of scientific revolutions” were content with the methods in western science. Kuhn was interested in describing how western science progressed through so called revolutions and he only challenged Popper’s view of western science where science advanced as a result of scientists attempting to falsify the existing theories. Even Feyerabend did not say that western science is “pattapal boru” (blatant lies) and the moment one came out with the view that western scientific theories and other abstract western knowledge are mere stories (pattapal boru) concocted by western intellectuals relative to Judaic Christian culture based on GJC Chinthanaya the whole hell broke lose. It is interesting to note that the greatest opposition came from Sinhala nationalists who defend western science without any understanding of western Physics that is at the pinnacle of western knowledge. People who have read on Physics from popular books but who have never studied that subject after the GCE (Advanced Level) formally with the Mathematics involved, very often failing in the subject at the examination, are the most ardent followers of western science. Incidentally the most attentive of the “pattapal boru” kathava are the students of the Faculty of Engineering at the University of Moratuwa who very often get very good marks in Physics and Mathematics at the GCE (Advanced Level) examination. Now what is the relevance of all these stories to Geneva? The Geneva circus is managed by western intellectuals with the assistance of people such as Navi Pillai who are very often educated people in the western tradition whatever their nationality, ethnicity, religion may be. To begin with, we are given the impression that Geneva is an international forum. It may be the United Nations Human Rights Council (UNHRC) that meets in Geneva every March but the stage is managed by the western countries that pretend to be the international. The west represents a bogus international but the hegemony of the Judaic Christian culture is such that the bogus international is projected as the international, of course, with the assistance of the products of western education found in media, universities, NGOs, parliament, judiciary, officialdom and other such places. The media discusses Geneva and project it to be a life and death experience of the ordinary people. Even if the resolution against Sri Lanka instigated by England and presented by USA is carried through what can the so called international do? The UNHRC in Geneva cannot impose economic sanctions but as we have been telling for more than four years there can be economic sanctions imposed by individual countries or group of countries on their own, to punish us for defeating the LTTE, the agent of the west not only against Sinhala Buddhist culture but the Tamil Hindu culture as well. The so called educated people are sacred at the outcome and they think that would have to starve to death if “unofficial” economic sanctions are imposed. The irony is that some of these educated people or at least their parents were not opposed to eating “bajiri” during the so called second world war (the computer insists that I begin these words with capital letters) which was a war of the west and not a world war, in order to safeguard and protect the interests of the English colonials. The elite schools were shifted to places such as Bandarawela during this time forcing the offspring of the privileged to stay away from home. The educated went through all these difficulties to protect not the sovereignty of the nation but the interests of the English colonials. For the educated, whether they were educated in English or Sinhala (Educated Tamils are outside the equation as their problem is formulated in a different way by the western intellectuals) safeguarding the interests of the English colonials appear to be more important than protecting the sovereignty of the nation, and they are prepared to sacrifice for the former purpose and not for the latter. Such is the power of the western education we receive at schools and universities. Let us feed the educated with some “bajiri” if the need arises. ඩී එස් සී උපාධිධාරී සේවාර්ජිත (සම්මානිත) මහාචාර්ය අශෝක අමරතුංග මහතා තමා මගෙන් ප්‍රශ්න දෙකක් අසා ඇති බවත් මා එතුමාගෙන් ප්‍රශ්න ඇසීමට පෙර ඒවාට පිළිතුරු දිය යුතු බවත් තම පෙබරවාරි 12 ලිපියෙන් කියා සිටියි. ඒ ප්‍රශ්න මෙසේ ය. 1) නිව්ටන්ගේ න්‍යාය බොරු නම් ඒවා යොදාගෙන හඳට යන්නේ කෙසේ ද? 2) යුද්ධය දිනන්නට අවශ්‍ය දැනුම (උදා - කොටින් ගේ නැව් පිළිබඳ තොරතුරු) මිතුරන්ගේ උදව් ඇතිව දෙවියන් ගේ මාර්ගයෙන් ලබා නො ගත්තේ ඇයි? මෙහි න්‍යාය යනුවෙන් සඳහන්වන්නේ ඉංගිරිසියෙන් තියරි (theory) යනුවෙන් කියැවෙන්න ය. පාරිභාෂික ශබ්දමාලාවල තියරී යන්න වෙනුවට වාදය, සිද්ධාන්තය, න්‍යාය යන පද දී ඇත. මහාචාර්යතුමා ෆැක්ට් යන්නට සිද්ධාන්තය යන්න යෙදුව ද එය වැරදි ය. කෙසේ වෙතත් තියරි යන්න වෙනුවට න්‍යාය යන පදය යෙදීම පාරිභාෂික ශබිදමාලාවලට එකඟ බැවින් අපි එය පිළිගනිමු. එහෙත් න්‍යාය යන්න න්‍යාය බිංදු වැනි පැරණි පොතපතෙහි යෙදෙන්නේ ලොජික් (logic) යන්න වෙනුවට ය. එබැවින් මම ලොජික් වෙනුවට න්‍යාය යන්න යොදා ගනිමි. මා තියරි යන්න වෙනුවට යොදාගන්නේ ප්‍රවාදය යන්න ය. වාදය යන්න ඉසම් (ism) යන්න වෙනුවට මාක්ස්වාදය (Marxism), පශ්චාත්නූතනවාදය (Postmodernism) ආදී තැන්හි යෙදෙන බැවින් හා ප්‍රවාද හා ජනප්‍රවාද අතර ඇති සම්බන්ධයත් තියරම් (theorem) යන්න වෙනුවට ප්‍රමේයය යන්න යොදාගැනීමත් සලකා මම තියරී යන්නට ප්‍රවාදය යන්න යොදාගනිමි. එහෙත් කිසිවකු තියරි යන්න වෙනුවට න්‍යාය යොදාගැනීම ගැන මගේ තදබල විරුද්ධතාවක් නැත. අනෙක් සියළු දෙනා මගේ ව්‍යවහාරය අනුගමනය කළ යුතු යැයි කීමට තරම් බොළඳබවක්, මුග්ධබවක් මට නැත. එහෙත් මහාචාර්යතුමා ෆැක්ට් (පරිසිද්ධිය) යන්න වෙනුවට කිසිම පාරිභාෂික ශබ්දමාලාවක නැති අන්දමින් හිතුවක්කාරව වැරදියට සිද්ධාන්ත (තියරි) යන්න යෙදීම ගැන නම් මට විරුද්ධ නොවී සිටිය නො හැකි ය. පරිසිද්ධියක් කෙසේවත් සිද්ධාන්තයක් බවට පත් නො වේ. ඒ මහතා නිරවුල් අවබෝධයකින් තොරව හිතුමතේ තම පාණ්ඩිත්‍යය පෙන්වීම සඳහා බොහෝ මහාචාර්යවරුන් මෙන් වචනවලින් දමාගැසීම නම් අඩුකර නැත. පෙබරවාරි 12 වැනිදා ලිපියෙහි ඒ මහතා අඥේයවාදය යන්න ස්කෙප්ටිසිසම් (skepticism) සඳහා යොදාගනියි. ස්කෙප්ටිසිසම් යනු යමක් නොදැනීම, අඥෙය යන අර්ථයෙන් යෙදෙන්නක් නොව සැකයක් ඇතිවීම යන අර්ථයෙන් යෙදෙන්නකි. ඒ සඳහා පාරිභාෂික ශබ්දමාලාවල ද යොදාගන්නා වචනය සංශයවාදය යන්න ය. අඥෙයවාදය යනු ඇග්නොස්ටිසිසම් (agnosticism) යන්නට යෙදෙන්නකි. සැකය යනු නොදැනීම යැයි පටළවාගන්නේ නොදැනුම් කමට විය හැකි නමුත් අමරතුංග මහතා දිගින් දිගට ම තම නොදැනුවත්කම හෙළිදරවු කිරීමට කිසිම සැකයකින් තොරව ඉදිරිපත්වීම තේරුම්ගන්නේ කෙසේ ද? ඒ මහතා එසේ තම නොදැනුවත්කම ප්‍රදර්ශනය කිරීමෙන් පසු ඉන් සෑහීමකට පත් නොවී ලෝකය නොපවතියි, සියල්ල බොරු ය යන්න අඥෙයවාදී අදහසක් බව පවසයි. යමකු ලෝකය නොපවතියි ආදී වශයෙන් කියන්නේ නම් එය නොදැනීමක් වන්නේ කෙසේ ද? සියල්ල බොරු යැයි කියන්නේ නම් එලෙස කියන්නේ නොදැනීමකින් නොව යම්කිසි දැනුමකින් ය. යමකු යමක් නැතැයි කියන්නේ දැනුමකින් මිස නොදැනුමකින් නො වේ. ඒ දැනුම ද බොරු විය හැකි ය. එහෙත් එහි අඥෙයවාදීභාවයක් නැත. අමරතුංග මහතා තේරුම් ගත යුත්තක් නම් වචන තිබෙන්නේ පඬිබව පෙන්වීමට නොව සන්නිවේදනයට හා හැකිතාක් නිරවුල් ව අදහස් සූත්‍රගත කිරීමට (formulate) බව ය. අඥෙයවාදයක් ගැන කතාකර අමරතුංග මහතා කියන්නේ සියල්ල මනසේ නිර්මිත වූ මායාවක් බව හෝ මනස නැති බව හෝ විඥානවාදී අදහස් බව ය. අමරතුංග මහතාගේ පරස්පර හා නො දැනුම්කම හේතුකොටගෙන ඔහුට අනුව මම අඥෙයවාදියෙක්මි. ඒ සමග විඥානවාදියෙක්මි. ඒ මහතා ඒ දෙකම එක්වර සපුරාලන්නේ කෙසේ දැයි පැහැදිලි කරන්නේ නම් මැනවි. අනෙක් අතට මනසක් නැතැයි කීම හා සියල්ල මනසේ නිර්මිත යැයි කීම දෙකම විඥානවාදී අදහස් බව අමරතුංග මහතා පවසයි. මනසක් ඇතැයි ගනිමින් සියල්ල මනසේ නිර්මිත යැයි කීම විඥානවාදී යැයි කිවහැකි නමුදු මනසක් නැතැයි කීම හා මනස මනසේ නිර්මාණයක් යැයි කීම විඥානවාදී වන්නේ කෙසේ ද? මනසේ පැවැත්ම ගැන මින් ඉහත අපේ ප්‍රවාද ලිපි පෙළෙහි ලිපි ගණනාවක් ම ලියා ඇත. බටහිර දැනුම් පද්ධතියෙහි වඩාත් නිරවුල් අදහස් ප්‍රකාශ කෙරෙන්නේ බටහිර ගණිතයෙහි, ගණිතමය භෞතික විද්‍යාවෙහි හා ඥානවිභාගයෙහි (epistemology) ය. වියුක්ත වූ ඒ ක්‍ෂෙත්‍රවල අදහස් ප්‍රකාශ කිරීම බටහිර වෛද්‍යවිද්‍යාවහි හෝ බටහිර දන්ත වෛද්‍යවිද්‍යවෙහි අදහස් ප්‍රකාශ කරනවාට වඩා සැලකිල්ලෙන් කළ යුත්තකි. ජනප්‍රිය පොතපතින් එහෙන් මෙහෙන් අහුලාගත් අදහස් ප්‍රකාශ කිරීමේ දී එලෙස සැලකිලිමත් වීමට නොහැකි වීම පුදුමයක් නො වේ. අමරතුංග මහතාගේ ප්‍රශ්න දෙකට පිළිතුරු දීමට ප්‍රථම කිවයුතු කරුණු බොහෝමයක් වුවත් එ පසුවට කල්තැබීමට සිදුවෙයි. විශේෂයෙන් ම ගුරුත්වාකර්ෂණය හා වැටීම පිළිබඳ ප්‍රශ්නය සම්බන්ධයෙන් අමරතුංග මහතා ඉදිරිපත් කරන පරස්පර විදහා දක්වමින් පිළිතුරක් දීම අත්‍යවශ්‍ය වෙයි. ඒ අතර විවික්ත (discrete) හා වියුක්ත (abstract) අතර වෙනස ද පැහැදිලි කළ යුතු ය. අමරතුංග මහතා වියුක්ත යනුවෙන් අදහස් කරන්නේ විවික්ත හෙවත් නොබැඳුණු යන්න ය. දැනට කිව යුත්තේ මා වියුක්ත යන්න විශේෂණ පදයක් ලෙස භාවිතා කරන්නේ අවුරුදු තිහක පමණ කාලයක සිට බවත් එය ඉංගිරිසි ඇබ්ස්ට්‍රැක්ට් (abstract) යන වචනයට වියුක්ත දැනුම් පද්ධතියක් (abstract system of knowledge) යන තැන්හි මෙන් විශේෂණ පදයක් ලෙස පාරිභාෂික ශබ්දමාලාවලට හා මලලසේකර ශබ්දකෝෂයට එකඟ ව යොදාගන්නා බවත් ය. ප්‍රත්‍යක්‍ෂය යනු කුමක් ද යන්න ද සුදුසු අවස්ථාවේ දී පැහැදිලි කරමි. ප්‍රත්‍යක්‍ෂය යන්න බ්‍රහ්මජාල සූත්‍රයෙහි සඳහන්වන බව අමරතුංග මහතා නොදන්නේ අන්තර්ජාලයෙන් ඒ ගැන දැනගැනීමට නොහැකි බැවින් ද? තන්තුවාදය පිළිබඳ ව මගේ දේශනයකට සහභාගි වී ඉගෙන ගන්නා ලෙස මම අමරතුංග මහතාට කිසිවිටෙක නොකීවෙමී. මා කීවේ මා සිටින තැනක ඒ පිළිබඳ ඔහුගේ දේශනයක් පවත්වා මා අසන ප්‍රශ්නවලට පිළිතුරු දෙන ලෙස ය. අමරතුංග මහතාට ඒ කරුණවත් නිවැරදිව අවබෝධ කරගැනීමට නොහැකි බව තම පෙබරවාරි 12 වැනි දා ලිපියෙන් ප්‍රදර්ශනය කරයි. ඒ මහතා නිතර කියන කරුණක් නම් ආලෝකයේ වේගයෙන් 90%කට අඩු වේගයකින් ගමන් ගන්නා වස්තු සඳහා නිව්ටන්ගේ ප්‍රවාදය වලංගු බව ය. අයින්ස්ටයින්ගේ ප්‍රවාදය බ්ල්ක්හෝල් හැර ඕනෑම වේගයකට වලංගු යැයි ඒ මහතා කියයි. මෙය තවත් පැහැදිලි කළේ නම් මැනවි. මේ බ්ල්ක්හෝල් හැර යන්නෙන් ඒ මහතා අදහස් කරන්නේ කුමක් ද? ජනප්‍රිය පොතපතෙන් ලබාගත අදහස් මෙසේ ගෙනහැර දක්වන්නේ තේරුම් ගෙන නොවන බව මම දනිමි. 90% වේගය නියම කළ ජනප්‍රිය පොත කුමක් ද? මේ ජනප්‍රිය පොත් ලියන ඇතැමුනට ද පැහැදිලි අවබෝධයක් නැත. ඉහත සඳහන් අදහස් මැතක දී කරන ලද පර්යේෂණවලින් තහවුරු වී ඇති බව කතුවරුන් දෙදෙනකුගේ නම් පමණක් සඳහන් කරමින් එහෙත් ඒ අදහස් පළවූ සඟරා නම් නොකරමින් ඒ මහතා කියයි. මේ පිළිබඳ මා නොදන්නා බව ඒ මහතා කියයි. ඒ මහතාට ඒ පිළිබඳ දේශනයක් පැවැත්වීමට මා ආරාධනා කරන්නේ එවිට මට ඒ මහතාගෙන් ඉගෙනීමට අවස්ථාවක් ලැබෙන බැවිනි! අමරතුංග මහතාගේ දැනගැනීම සඳහා කිවයුතු කරුණක් නම් සාධාරණ සාපේක්‍ෂතාවාදය යනු විශේෂ සාපේක්‍ෂතාවාද යට ගුරුත්වාකර්’ෂණය එකතු කිරීමෙන් ලබාගත්තක් නොව ගුරුත්වාකර්ෂණය නැතැයි ගැනීමෙන් ලබාගත්තක් බව ය. එහෙත් මා නිව්ටෝනීය ගුරුත්වාකර්ෂණය පට්ටපල් බොරුවක් යැයි කීමට මේ සංවාදයෙහි දී සාධාරණ සාපේක්‍ෂතාවාදය යොදා නොගත් බව ද සඳහන් කළ යුතු ය. එසේ යොදාගත් බව කියන අමරතුංග මහතා ඒ පිළිබඳ සාක්‍ෂි සපයන්නේ ද? අමරතුංග මහතා නගා ඇති පළමු ප්‍රශ්නයට පිළිතුරු පහත පළවෙයි. දෙවැනි ප්‍රශ්නය ලබන සතියේ සාකච්ඡා කරමු. අප භාවිතා කරන ලොකුම බොරුව “මම” යන්න ය. මා යනුවෙන් කිසිවකු නැතිව සිටිය දී, මා යනු මනසෙන් නිර්මාණය කරගත් බොරුවක් ව තිබිය දී අපි ඒ සංකල්පය යොදා ගන්නෙමු. අපේ දැනුම එපරිදි ය. සම්මුති වශයෙන් අප තනාගත් සංකල්ප, ප්‍රවාද ආදී දැනුම් අපේ එදිනෙදා කටයුතුවල දී අපි යොදාගන්නෙමු. මා ගෙදර යනවා, දේශනයක් පවත්වනවා ආදී යෙදුම් අප පිළිගන්නේත් එවැනි යෙදුම් යොදාගෙන අප ගෙදර යෑම, දේශන පැවැත්වීම ආදී වශයෙන් සාර්ථක ප්‍රතිඵල ලබාගන්නේත් මම යන්න සංකල්පය බොරුවක් ව පවතිද්දී ය. නීල් ආම්ස්ට්‍රෝන්ග් තමා හඳට ගිය බව පැවසුවේත් ආම්ස්ට්‍රෝන්ග් යනුවෙන් අයකු ඇතැයි යන බොරුව යොදාගනිමිනි. එහෙත් ඒ බොරුවෙන් අමාරුවේ වැටෙන අවස්ථා ද වෙයි. ක්‍ෂණයකට වුවත් මා පවතින්නේ යැයි ගැනීම ආත්මවාදී වෙයි. මා ගෙදර යනවා යැයි කී විට එසේ කීමෙන් මා ආත්මවාදියකු බවට පත්වන නමුත් සම්මුතියේ දී අපට එය ප්‍රශ්නයක් නො වේ. එහි ඇති ආත්මවාදී අදහස ගැන අපි ගැඹුරෙන් නො සිතමු. එහෙත් පරළොව යන්නේ කවුදැ යි ඈසූ විට එය තරමක දාර්ශනික ප්‍රශ්නයක් බවට පත්වෙයි. ගෙදර යන්නේ කවුද, හඳට ගියේ කවුද ආදී ප්‍රශ්නවලදීත් ආත්මවාදය නොසලකා හැරීම වැරදි වුවත් සම්මුතියෙන් අපි ඒ බැරැරුම් ප්‍රශ්න ලෙස නො සලකමු. එහෙත් පරළොව යන්නේ ද මා යැයි කී විට අපට එය ආත්මවාදී ලෙස ගැනීමට සිදුවෙයි. පරළොව යෑම හඳට යෑමට හෝ ගෙදර යෑමට හෝ වෙනස් නොවන නමුත් අපි ආත්මවාදය යන්න පරළොවත් සමග සැලකීමට පුරුදු වී සිටිමු. එබැවින් ආත්මවාදය ප්‍රතික්‍ෂෙප කරන බෞද්ධයකුට (බෞද්ධයන් යනු තුන්වැනි සංගායනාවේ ථෙරවාදය පිළිගත් අශෝක බෞද්ධයන් පමණක් නොවන බව අවධාරණය කළ යුතු ය) පරළොව යන්නේ කවුද යන ප්‍රශ්නයට මා යැයි කිව හැකි නො වේ. මිළිඳු රජුගේ ප්‍රශ්නයකට පිළිතුරු දෙමින් නාගසේන හිමියෝ පරළොව යන්නේ තමාත් නොවේ ය, අන් අයකුත් නො වේ යැයි පැවසූහ. ඒ පිළිතුර ඇරිස්ටෝටලීය න්‍යාය (ලොජික්) සමග එකඟ නොවන නමුත් චතුස්කෝටික න්‍යායට එකඟ ය. ඒ පිළිතුර ආත්මවාදී ද නො වේ. නාගසේන හිමියන් ගෙදර යන තැනේ දී මෙන් පරළොව යන්නේ තමන් යැයි දේශනා කළේ නම් උන්වහන්සේ ආත්මවාදී වන බව පැහැදිලි ය. මා යන බොරුව යොදාගෙන අපට සම්මුතියෙන් ගෙදර ගිය හැකි ය, හඳට ගිය හැකි ය. එහෙත් එයින් කියැවෙන්නේ මා යනු බොරුවක් නොවන බව නො වේ. නිව්ටන්ගේ ගුරුත්වාකර්ෂණ ප්‍රවාදය ද එබඳු ය. එය පට්ටපල් බොරුවකි. එය පංචෙන්ද්‍රියයන්ට ගෝචර වීම පසෙකින් තබා මනසින් මවාගැනීමටවත් නොහැකි පට්ටපල් බොරු කතන්දරයකි. මගේ ව්‍යවහාරය අනුව පංචෙන්ද්‍රියයන්ට ගෝචරව මනසින් ගන්නා සංකල්ප බොරු ය. පංචෙන්ද්‍රියයන්ට ගෝචර නොවන මනසින් මවාගත නොහැකි සංකල්ප පට්ටපල් බොරු ය. ඒවා බුදුදහමට අනුව නම් පඤ්ඤත්ති, එනම් අප විසින් (මනස විසින්) පැනවෙන සංකල්ප පමණ ය. මේ පිිළිබඳ විස්තර විදුසර අපේ ප්‍රවාද ලිපිවල අවුරුදු දෙකකට පමණ පෙර පළවිය. කාලය යන්න ද පඤ්ඤත්තියකි. බුද්ධඝෝෂ හිමියන් ඒ බව අත්ථසාලිනියෙහි සඳහන් කළ බව මගේ ලෝකය පළමු මුද්‍රණයෙහි සිට ම අප කියා ඇත. කාලය ද පට්ටපල් බොරුවකි. අද බටහිර විද්‍යාඥයන් කාලය යනු කුමක් දැයි ප්‍රශ්න කරන නමුත් අඩුම තරමෙන් පස්වැනි සියවසේ සිට එය පට්ටපල් බොරුවක් බව අපි දනිමු. කාලය පට්ටපල් බොරුවක් වුවත් අපි එය සාර්ථක ව යොදා ගනිමු. ඒ පට්ටපල් බොරුව මැනීමට ඔරලෝසු ද පාවිච්චි කරමු! බුද්ධඝෝෂ හිමියන් ද නාගසේන හිමියන් ද අයත්වූයේ ථෙරවාද සම්ප්‍රදායට බව මෙහි දී මතක් කරමු. ඇමරිකානුවෝ බියෙන් පසුවෙති. ඔවුන් පමණක් නොවේ මුලු මහත් බටහිර සමාජයමපසුවන්නේ බියකිනි. පොදුවේ බටහිරුන්ටද ඇත්තේ ඇමරිකන් බියය. රතන සූත්‍රයටඅනුව බුදුන් දවස විශාලා නුවර වැසියන්ට තිබුනේද බියකි. එදා ඒ නුවරදුර්භික්‍ෂයක් තිබුනත් නුවරුන් පීඩාවට පත් කලේ දුර්භික්‍ෂයට වඩා ඒ පිළිබඳබිය යැයි සිතිය හැකිය. රතන සූත්‍රය දේශණා කලේ ඒ බිය නැති කිරීමටය. මීට සමානනොවුනත් බටහිරුන්ටද ඇත්තේ මේ ආරේ බියකි. අඩු තරමින් විශාලා නුවර වැසියන්ටතිබුනු රෝග, දුර්භික්‍ෂ හා අමුනුස්ස බිය තියුණු මුත් තාවකාලික (acute) එකක්විය. ඇමරිකන් බිය නිදන්ගත (chronic) බියකි. එය බටහිර සංස්කෘතියේම කිඳා බැසඇත. ඇමරිකන් බියට හේතුව වෙනකක් නොව පොදුවේ ඒ සමාජය තුලඇති බදා ගැනීමේ ගතියය. බදා ගන්නේ වෙන් කර ගන්ටය. වෙන් කර ගන්නේ බදා ගන්ටය.වෙන් කර ගත් දෑ අහිමි වේ යැයි බියක් හට ගන්නා අතර වෙන් නොකර ගත් දෑ හිමි වේයැයි බියක් හට ගනී. වෙන් කෙරීම හා බදා ගැනීම නිසා හටගන්නා හිමිවේය හෝඅහිමිවේය හෝ යන බිය ඇමරිකන් බියය. බටහිර රටවල ලෞකික සැපපහසුකම් කෙතෙකුත් තිබුනද බොහෝ දෙනා නොකියන කථාව නම් ඒ සැප පහසුකම් නැතුවඑහි ජීවත්වීම අති දුෂ්කර බවය. වෙනත් ආකාරයකට කියන්නේ නම් එහි ජීවන ක්‍රමයසැකසී ඇත්තේ ඒ රටවල ඇති සැප පහසුකම් නැතිව ජීවත් වීම දුෂ්කර වෙන අන්දමටය.උදාහරණයක් වශයෙන් ඇමෙරිකාවේ නගර කිහිපයක හැර සෙසු ප්‍රදේශවල වෙසෙනමිනිසුන්ට යන්ට එන්ට පුද්ගලික වාහනයක් නැතිව බැරිය. මේවා අපි සාමාන්‍යයෙන්සම්පත් යැයි සලකන නිසා ඒවා හිමිවීමම ධනාත්මක ලෙස ගැනුනද ඇත්තෙන්ම මෙහිසිදුවන්නේ මේ ලෞකික සම්පත් නැතිවිට ඇතිවන සෘන බව තුලණය කිරීමය. හිමිදේ අහිමි කර ගැනීමට මෙන්ම අහිමි දේ හිමි කර ගැනීමටද ඇමෙරිකානුවෝ බිය වෙති.දුක් රෝග වේදනා ආදියට ඇමෙරිකානුවෝ බියක් දක්වති. ඔවුහු ලෙඩ හැදේ යැයිබියෙන් ලෙඩ නොවී සිටීම සඳහා නොයෙකුත් ප්‍රතිකාර ගනිති. වේදනා නොවිඳ සිටීමටනිර්වින්දක ඖෂධ භාවිතා කරති. සුලු සමාජීය විශමතා මානසික රෝග ලෙස සලකාගෙනඉන් ගැලවෙන්නට යැයි කියා බෙහෙත් ගනිති. සමහර දෙමව්පියෝ දරුවන්ට කුඩාකාලයේදීම මානසික රෝගවලට දෙන බෙහෙත් ලබා දෙන්නේ තම දරුවන් සමාජයේ අසම්මතදරුවන්වේ යැයි බියෙනි. ඇමෙරිකානුවෝ දුක් රෝග වේදනා ආදියෙන් මිදී සිටීමටඅධික වෙහෙසක් ගනිති. එය අසාර්ථක වූවිට විඳන විඳවීමද ඉහලය. හිමිකර ගැනීම තුලින් ඇති කර ගන්නා ධනාත්මක බව වැඩි වන විට එය අහිමි කරගැනීමෙන් ඇතිවිය හැකි සෘණාත්මක බවද වැඩිය. අනිත් අතට යමක් නැති කර ගැනීමතුලින් ඇති කර ගන්නා ධනාත්මක බව වැඩි වන විට එය ඇතිවීමෙන් ඇතිවිය හැකිසෘණාත්මක බවද වැඩිය. ඒ අනුව ඇමරිකන් බිය යනු සෘණ වීමට ඇති බිය ලෙසහැඳින්විය හැකිය. සෘණ වීමට ඇති බිය නිසා ඔවුහු ධන බව වැඩි කර ගනිති. නමුත්ධන හා සෘණ බව අගයෙන් වැඩි වන විට ඊට අනුරූපව බිය වැඩි වන බැවින් ධනෙන් සෘණතුලණය කල හැකි වුවද බිය නැති කල නොහැකිය. බිය සාපේක්‍ෂ වශයෙන් අවම කර ගන්නටනම් සෘණ මෙන්ම ධන බවද අඩු කර ගත යුතුය. එනම් ඇලී ගැලී නොසිටිය යුතුය. දැන්දැන් සිංහලුන්ටද ඇමෙරිකානු බිය ඇත. ඒ ඔවුන්ද බටහිර සංස්කෘතිය අනුකරණයකරමින් බදා ගන්නා ගතියට පුරුදු වෙමින් සිටින හෙයිනි. අපේ වැඩිහිටියන්ට මෙන්නොව අපට අද නැතිවෙන්ට බොහෝ දේවල් ඇත. ඉතින් බිය නොවී සිටිය හැකිද? නැතිවෙන්නට යනවිට අපි කරන්නේ තව තවත් බදා ගැනීමය. ඒ නිසා චක්‍රීයව තව තවත් බියවැඩි කරවයි. බදා ගන්නා ගතියට පුරුදු වෙනවිට ගැලී නොගැලී සිටීමට හෝගැලෙන්නෙත් නැතිව නොගැලෙන්නෙත් නැතිව සිටීමට ඇති හැකියාව දුර්වල වේ. මාකලින් සඳහන් කලටැන්සානියානු හස්ඩක් ගෝත්‍රිකයින්ටඇමෙරිකානු බියක් නැත. ඔවුහු තම සතු දේ නොපැකිලිව අන් සතු කරති. හස්ඩක්වරුන්ට සාපේක්‍ෂව අද අපි සිටින්නේ පහත තැනකය. බටහිරුන් සිටින්නේ ඊටත් චඩාපහත තැනකය. බටහිරුන් ධන බව වැඩි කර ගන්නේ ලෝකය තමන්ට රිසිපරිදි සකස් කර ගනිමිනි. ලෝකය තමන්ට රිසි අකාරය හැඩ නොගැසී තිබීම බටහිරුන්ටඇමරිකන් බිය ගෙනදෙන්නකි. ඔවුන් හැකිතාක් දුරට තම රටවල සංස්කෘතිය සමජාතීයකරන්නට උත්සාහ කරන්නේ එබැවිනි. තම රටවල පමණක් නොවේ අන් රටවල්ද ඔවුන්ටආකාරයට හැඩ ගසා ගැනීමට ඔවුන් උත්සාහ කරන්නේ ඒ නිසාය. ලෝකය පාලණය කල හැකියැයි ඔවුහු සිතති. එක්සත් ජාතීන්ගේ සමුළුව හරහා ඔවුන් සංස්කෘතියෙන් බටහිරනොවන රටවල් වලට බලපෑම් කරන්නේ ඇමරිකන් බිය නැති කර ගැනීමටය. ජිනීවාහිදීලංකාවට විරුද්ධව චෝදනා ගෙන එන්නේ ඔවුන්ගේ ඇමරිකන් බිය නිසාය. ඇමරිකාවේරාජ්‍ය දේපාරතමේන්තුවේ වැඩ ගැන සාමාන්‍ය ඇමරිකානුවන්ට එතරම් උනන්දුවක්නැත. ඒ ඔවුන්ගේ දේශපාලන විඥ්ඥානය මොට කර ඇති බැවිනි. රාජ්‍යදේපාරතමේන්තුවෙන් පත්වී එන තානාපතිවරුන් හා අනෙක් නිළධාරීන් ක්‍රියාවටනංවන්නේ රජයේ ප්‍රතිපත්තිය. ඔවුන් සමහරවිට එකිනෙකා පරයමින් අපට කස පහරදෙන්නට උත්සාහ කරන්නේ ඔවුනොවුන් අතර ඇති වෘතීයමය තරඟය නිසාද වෙන්නට පුලුවන.තමන් තදින් පහර නොගැසුවොත් කසය වෙනකෙකුට දෙනු ඇතැයි ඔවුහු බිය වෙති. එතනදඇත්තේ ඇමරිකන් බියමය. කෙසේ නමුත් රාජ්‍ය දෙපාර්තමේන්තුවේ වැඩ ගැන සාමාන්‍යඇමරිකානුවන් දැන ගත්තත් නොදැනගත්තත් ඒ වැඩ සාමාන්‍ය ජනතාව අනුමත කරන බවඇමරිකානු රජය දනී. ඇමරිකානුවන්ට සමාජයක් වශයෙනුත් පුද්ගලිකවත් ඇමරිකන් බියඇත. ජිනීවාහිදී ලංකාවට විරුද්ධව චෝදනා ගෙන එන්නේ බටහිර සංස්කෘතියේ ඇති මේනිදන්ගත බිය නිසාය. ඇමරිකන් බිය පිරිත් කියා සමණය කලහැකිදැයි සැකය. බිය වැඩිවෙන්නේ තදින් බදා ගෙන සිටින නිසා බව බටහිරුන්තේරුම් නොගනිති. නමුත් බටහිර නොවන අන් බොහෝ සංස්කෘතිවල ජනයාට ඒ ගැන යම්අවබෝධයක් ඇත. යම් හෙයකින් බටහිර රජයන් අපට ආර්ථික සම්බාධක පැණවුවහොත් ඒසම්බාධක වලට බිය නොවී සිටීමට මේ අවබෝධයද වැදගත් වනු ඇත. ජෙනීවා ප්‍රශ්නයක් වී ඇත්තේ මෙරට ඊනියා උගතුන්ට ය. බටහිර අධ්‍යාපනයක් ඉංගිරිසියෙන් හෝ සිංහලෙන් ලබා ඇති මේ උගත්තු බටහිරයන්ගේ බටහිර විද්‍යාව ඇතුළු පට්ටපල් බොරුවලින් මුළා වෙති. ඔවුන්ට තම ඊනියා උගත්කම පෙන්වීමට ද ජෙනීවා උදවු වෙයි. ජෙනීවාහි දී කුමක් වේ ද? ආර්ථික සම්බාධක පැණවීමට ඉඩක් වේ ද? ආදී ප්‍රශ්න මේ උගතුන්ගේ සාකච්ඡාවට භාජනය වෙයි. එහෙත් නියම ප්‍රශ්නයට උගතුන්ට මගහැරෙන්නේ ඔවුන් උගතුන් පමණක් වූ බැවිනි. ඔවුන්ට අනුව අද ඇත්තේ මානුෂික මෙහෙයුම්වල අවසාන සති දෙකෙහි මානව අයිතිවාසිකම් කඩවීම පිළිබඳ ප්‍රශ්නයකි. එහෙත් දෙමළ ජාතිවාදයට ඇතැම් දේ දෙන්නේ නම් මානව අයිතිවාසිකම් කඩවීම් පිළිබඳ චෝදනා අස්කර ගැනීමට බටහිරයන් කැමත්ත පළකර ඇති බව ඔවුහු අමතක කරති. බටහිරයන්ට ඇත්තේ මානව අයිතිවාසිකම් කඩවීමේ ප්‍රශ්නයක් නොව සිංහල බෞද්ධ චින්තනය හා ඔවුන්ට අවනත නොවී කොටින් පැරද වූ මහින්ද රාජපක්‍ෂ ආණ්ඩුව පැරදවීමේ අභිලාෂයකි. අද එ ජා පක්‍ෂයේ කිරිඇල්ලත් ජ වි පෙ නව නායකයාත් බෙරිහන් දෙමින් කියන්නේ ජෙනීවා ප්‍රශ්නය ඇති වී තිබෙන්නේ ආණ්ඩුවේ වරදින් බවත් ජෙනීවා යෝජනා ආණ්ඩුවට මිස රටට විරුද්ධ ව නොවන බවත් ය. මේ අතර මාදුළුවාවේ සෝභිත හිමියන් පවසා ඇත්තේ මානව අයිතිවාසිකම් කඩවීම් පිළිබඳ ජාත්‍යන්තර පරීක්‍ෂණයක් පැවැත්වීමට තමන්වහන්සේ එකඟ බවත් වරදක් කර නැත්නම් එවැනි පරීක්‍ෂණයකට බිය නොවිය යුතු බවත් ය. උන්වහන්සේ ජනාධිපතිවරණයේ දී පොදු අපේක්‍ෂක (අපේක්‍ෂකයන් වහන්සේ) බවට පත්වීමටත් කැමැත්ත පළකර ඇත. සෝභිත හිමියන් ජනාධිපතිවරණයේ දී තරග කළහොත් ලබාගන්නා ඡන්ද සංඛ්‍යාව වලංගු ඡන්ද සංඛ්‍යාවෙන් සියයට විසිපහකට අඩුවන බැවින් ඒ ගැන කතා නොකර සිටීම වැඩදායක ය. එහෙත් ඊනියා ජාත්‍යන්තර පරීක්‍ෂණය ගැන කතා නොකර සිටීමට නො හැකි ය. මේ ජාත්‍යන්තරය යනු කවු ද? දෙමළ ජාතික සංධානයේ සිංහල විරෝධී ඊළාම්වාදී ප්‍රේමචන්ද්‍රන්ලා ද ඉල්ලා සිටින්නේ ඊනියා ජාත්‍යන්තර පරීක්‍ෂණයකි. ඔවුහු මෙරට දී සිදු කෙරෙන පරීක්‍ෂණයකට විරුද්ධ වෙති. ඔවුහු ජනගනන හා සංඛ්‍යාන දෙපාර්තමේන්තුවේ සංඛ්‍යා ලේඛනවලට ද විරුද්ධ වෙති. ඒ ඔවුන් මෙරට රාජ්‍යයෙන් වෙන් වී ඊනියා ජාත්‍යන්තරයේ අනුග්‍රහය මත ඊළමක් පිහිටුවීමේ අවශ්‍යතාව වෙනුවෙන් පෙනී සිටින බැවිනි. සෝභිත හිමියන්ට එවැනි අවශ්‍යතාවක් නැතැයි අපි තවමත් උපකල්පනය කරමු. එහෙත් ඊනියා ජාත්‍යන්තරය යනු ලෝක ජාත්‍යන්තරයක් නොව එංගලන්තය, ඇමරිකාව ආදී බටහිර රටවල් කිහිපයක ව්‍යාජ ජාත්‍යන්තරයකි. අප රටේ දෙමළ ජාතිවාදී ප්‍රශ්නය ඇති කළේ එංගලන්තය ය. එංගලන්තයත් ඇමරිකාවත් ඇතුළු ව්‍යාජ ජාත්‍යන්තරයට අවශ්‍ය ග්‍රීක යුදෙවු ක්‍රිස්තියානි චින්තන ආධිපත්‍යය හා යුදෙවු ක්‍රිස්තියානි සංස්කෘතික ආධිපත්‍යය ලෝ පුරා පැතිරවීමට ය. එහි දී ඔවුන්ට සිංහල බෞද්ධ චින්තනය හා සංස්කෘතිය කුඩු පට්ටම් කර දැමීමට අවශ්‍ය වෙයි. ඔවුන් 1650න් පසු ගෙන් වූ දෙමළ වෙල්ලායන් ද දැන් බටහිර සිටින විසිරුණු දෙමළ ජනයා ද යොදා ගන්නේ සිංහල බෞද්ධ සංස්කෘතියට හා චින්තනයට එරෙහි ව ය. මුළු මහත් දෙමළ ප්‍රශ්නය ම සිංහල බෞද්ධයනට එරෙහිව අධිපතිවාදී යුදෙවු ක්‍රිස්තියානි සංස්කෘතිය විසින් ඇතිකරන ලද්දකි. අවාසනාවකට අද බටහිරයන් සිංහල බෞද්ධ චින්තනය සමග නැති භික්‍ෂූන්ගේ පල්ලි නිකායක් ද ඇතිකර සිංහල බෞද්ධ චින්තනයට විරුද්ධ ව එය යොදාගනු පෙනෙන්නට ඇත. ව්‍යාජ ජාත්‍යන්තරය පහළොස්වැනි සියවසේ සිට අද දක්වා ම නිරන්තරයෙන් මානව අයිතිවාසිකම් කඩකරමින් අපේ රණවිරුවන් අතින් සිදු වී යැයි කියන මානව අයිතිවාසිකම් කඩවීම් ගැන පරීක්‍ෂණ කළ යුතු යැයි කියන්නේ එ ජා ප හා ජ වි පෙ වැනි සිංහල බෞද්ධ විරෝධී පක්‍ෂ කියන ආකාරයට ආණ්ඩුවට විරුද්ධව නොව සිංහල බෞද්ධ චින්තනයට හා සංස්කෘතියට එරෙහි ව ය. ඉහත කී පක්‍ෂ ජෙනීවා චෝදනා ආණ්ඩුවට විරුද්ධව යැයි කියන විට ඔවුන් තැත්කරන්නේ එහි ඇති සිංහල බෞද්ධ විරෝධය වසා දැමීමට ය. ව්‍යාජ ජාත්‍යන්තරය පරීක්‍ෂණවලින් රටට හා සිංහල බෞද්ධ සංස්කෘතියට පහර දීමට බලාපොරොත්තු වෙයි. David Cameron, the Prime Minister of England has a second job. It is not a part time spring job as he is supposed to be active in the second job as well during his tenure as the Prime Minister of England. He has assumed duties as the de facto leader of opposition of Sri Lanka operating from Westminster and number 10, Downing Street, as the so called opposition in Sri Lanka is not effective the way he wants. He is a single issue leader of opposition ostensibly preoccupied with human rights of Tamils, the media people, NGO wallas, and of course leaders of anti nationalist political parties that submit “hora” (bogus) lists to the commissioner of elections having failed to find the required number of people to contest even at a Provincial Council election, and last but not least single issue candidates at Presidential elections concentrating on abolition of executive Presidency. The politics of Sri Lanka is between the UPFA and the conservative – labour alliance in England assisted by Obama and his colleagues in USA. As far as Sri Lanka is concerned all these people have formed an alliance under the leadership of Cameron. The objective of the alliance is the removal of the Rajapakse “Regime” but they pretend to be obsessed with the human rights issue in Sri Lanka. Geneva, London and Washington and not Colombo of western province or Galle of the southern province are the centers of Sri Lankan politics with people such as Navi Pillai and American State Department officials together with those from Whitehall in London working as paid servants for the combined opposition mentioned above. The leading theoretician as far as the west is concerned is neither a so called postmodernist, a post Marxist, Fukuyama who wrote “The end of history”, a Keynesian, a Monetarist nor an “intellectual” from Peradeniya, but Samuel Huntington. His Clash of Civilizations is the new Bible of the west and what we experience all over the world is a clash between the cultures and Chinthanayas though not strictly according to Huntington. His book may have created initially a self congratulatory feeling among some nationalists thinking that the former had appreciated their views, but it was soon explained that the authour was only warning the western leaders of the struggle after the collapse of the Berlin wall. However, what had not been realized by Huntington was that at least since the commencement of Greek Judaic Christian (GJC) Chinthanaya towards the end of the fifteenth century, it had been a clash between Chinthanayas and cultures, and we are experiencing the phase where GJC Chinthanaya is being challenged by the Islamic Chinthanaya and (Theravada) Buddhist Chinthanaya. The GJC Chinthanaya is in its last stages of existence and has a mortal fear of the two Chinthanayas mentioned above. The Islamic Chinthanaya has the military power while the (Theravada) Buddhist Chinthanaya has the spiritual strength to defeat the nature destructing economics of the GJC Chinthanaya. The Sinhala Buddhist Chinthanaya, which is older than and not exactly the same as scholastic Theravada Buddhist Chinthanaya to the dismay of those imitative sociologists and others who for example write on Buddhism Betrayed, Protestant Buddhism, Dutugemunu the tyrant, is capable of defeating in Sri Lanka the GJC Chinthanaya sponsored military outfits betraying Buddhism Betrayed, through warfare, yes warfare, in spite of “panathipatha”, as has been shown from 1506 to 2009. 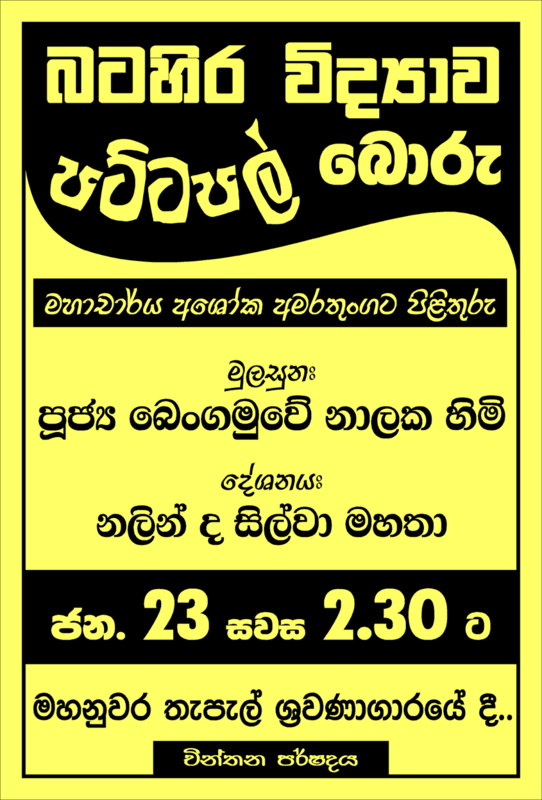 We in Chinthana Parshadaya are prepared for a second Panadura vadaya (Panadura debate) on “warfare” in Sinhala Buddhist Chinthanaya if a sociologist (emeritus or otherwise) of the academia from here or abroad is interested in an open public debate conducted at a place such as the public library auditorium in Colombo. In Sri Lanka the Sinhala Buddhists have defeated the western countries militarily as well, as the Portuguese, the Dutch and the English know through experience. If not for the Sinhala English Pact of 1815, named the Kandyan Convention by the English “intellectuals” with their imitators echoing it, the English would not have been able to conquer the whole country. As we have said often the English wanted the English educated Tamil Vellalas to be the leaders of the country instead of the Sinhalas, especially the Sinhala Buddhists, but their plans came to naught with the cardinal sin committed by the former from their point of view, when they introduced universal franchise in 1931. The English then began to concentrate on establishing an eelam with the help of the English educated Tamil vellalas but the latter proved ineffective and soon the Karaivar Prabhakaran took the leadership. The English now use the dispersed Tamils in their countries to defeat the Sinhala Buddhist Chinthanaya, through the TNA and the adjunct organizations of the UN. The aim and the objective of the English with respect to Sri Lanka is to mortally defeat Sinhala Buddhist Chinthanaya that also has the military strength to defeat in Sri Lanka the outfits based on GJC Chinthanaya as has been proved by the defeat of the LTTE in 2009 in Nandikadal. Though there are other countries including England and USA with horrible records on violation of human rights records it is Sri Lanka that comes to limelight in Geneva. The Sri Lankan media is also responsible for the state of affairs, in a way, as they give unnecessary publicity to the “Geneva gilmaat”. It is a “gilmaat” in more than one way as what the west is interested in is changing the government or a “regime change” in their language and not in the violation of human rights of anybody in the country. The west has indicated that they are prepared to drop charges on human rights violation if the Sri Lankan government betrays the sovereignty of the people. It has to be recorded that the GJC Chinthanaya while using the TNA to defeat the Sinhala Buddhist Chinthanaya, is working against the Tamil Hindu Chinthanaya as well through the money of the dispersed Tamils in the west. This has been going on for some time, even before the days of Chelvanayakam, and especially through the LTTE using other means, and it appears that the Chief Minister of the Northern Province has begun to realize it now though not exactly the way we see it. It is time for ordinary Buddhists, Hindus, Muslims, Christians, Catholics and others in Sri Lanka to get together against the hegemony of the GJC Chinthanaya. The west wanted to use various springs following the Arab experience but there is no effective opposition in Sri Lanka to lead such a spring. The political parties and the NGOs failed with the so called springs of the fishermen, the pensioners, the university academics and finally the UNP and the NGOs learning a lesson with the “Aluthkade” spring. None of these organizations has any nationalistic inclinations and they have no place in Sri Lankan politics at present. The west is unable to use any of these parties or groups to “change the regime” and as a last resort some of the imitators in Sri Lanka appear to have turned towards a well known Bhikku as the so called common candidate at the Presidential elections, having failed with past Presidents, past Chief Judges, past Army commanders. What the NGOs, the Tamil intellectuals, the Marxists and the others who have no understanding of the Sinhala mind do not realize is that a Bhikku who has lost touch with the Sinhala Buddhist Chinthanaya would poll less than one third of the votes that Mahinda Rajapakse would poll at the next presidential elections. The Sinhala Buddhists incidentally refer to a new Nikaya called Palli Nikaya to categorize the Bhikkus who do not subscribe to the Sinhala Buddhist Chinthanaya, and Palli Nikaya Bhikkus nor the associated “dayakas” have no impact on Sri Lankan politics. The leader of the UNP is only a bystander while the new leader of the JVP can organize the last rites of the party. The western politicians unlike their imitating “intellectuals” in Sri Lanka realize that “Palli Nikaya” Bhikkus and lay people who talk of LLRC report, now with a plus, and international investigations are incapable of defeating Mahinda Rajapakse that itself is a phenomenon that they cannot understand. Mahinda Rajapakse phenomenon cannot be understood with concepts such as populist politics or Sinhala Chauvinism echoed by simpletons. The west has only the Ananthi - Premachandran faction of the TNA to depend on in Sri Lanka, as they do not have much sympathy for the India sponsored Sampanthan – Wigneshwaran faction. However, the west cannot change “the regime” solely through the Ananthi – Premachandran faction and realizing the incapability of the Sri Lankan opposition Cameron has decided to intervene directly in order to achieve what the west wants. We have, from the beginning, told that the English politicians are not after the Tamil vote in some suburbs in London, but it is the former who use the dispersed Tamils in England and other western countries such as Canada, to defeat the Sinhala Buddhist Chinthanaya if possible. The Geneva meeting in March cannot impose economic sanctions officially but the England led west would apply pressure on Sri Lanka through other economic means. However, the average person, though not the “educated” city wallas, is prepared to face any consequences to protect the sovereignty of the country as has been done for thousands of years, and what Cameron in his capacity as the de facto leader of opposition of Sri Lanka does not understand is the spiritual strength of Sinhala nationalism.